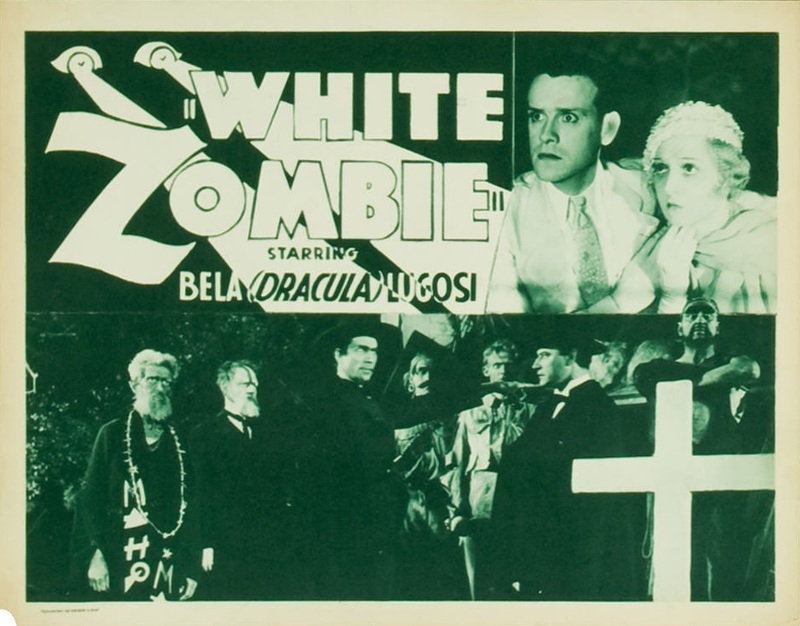 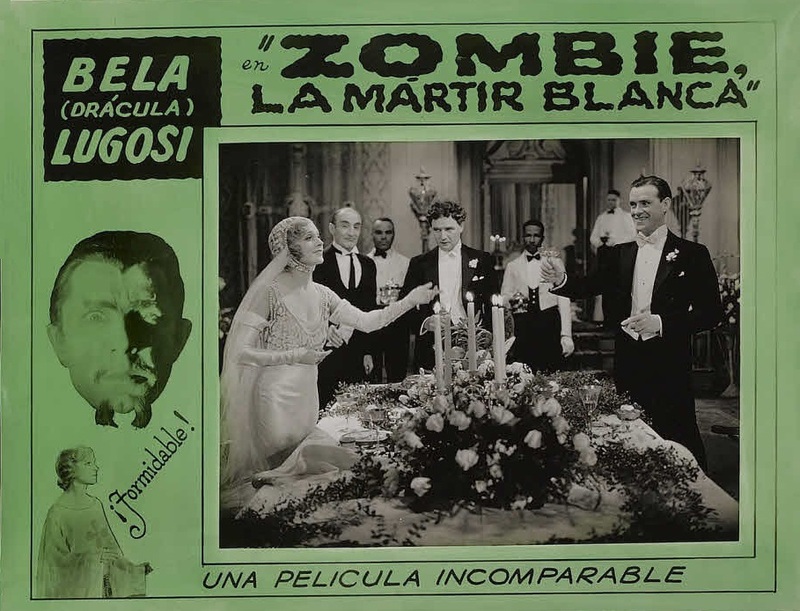 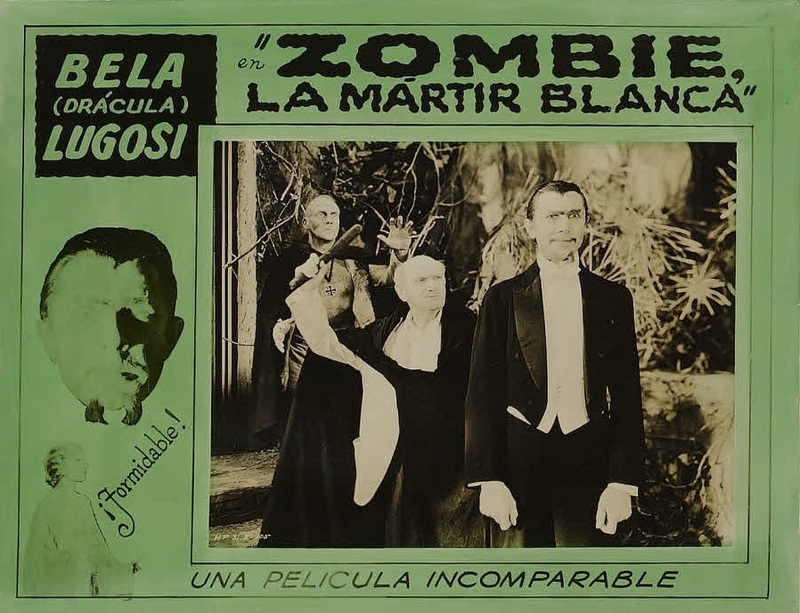 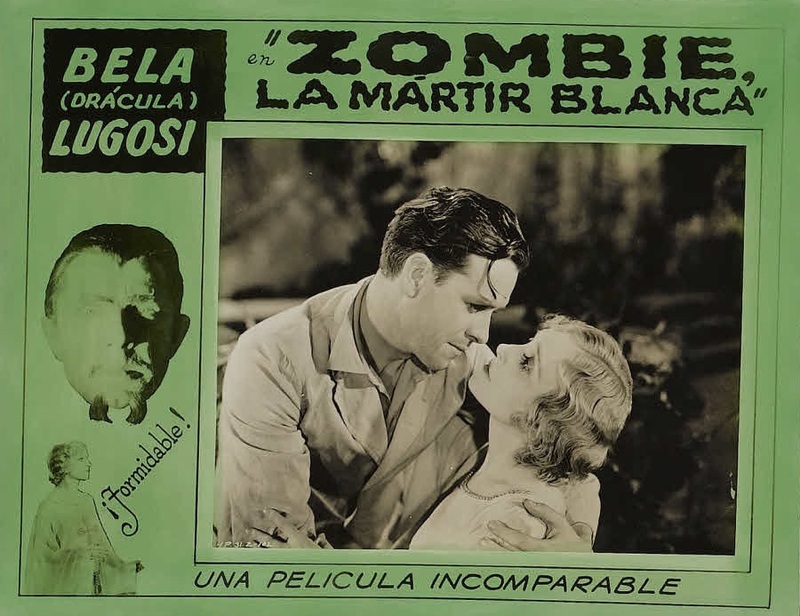 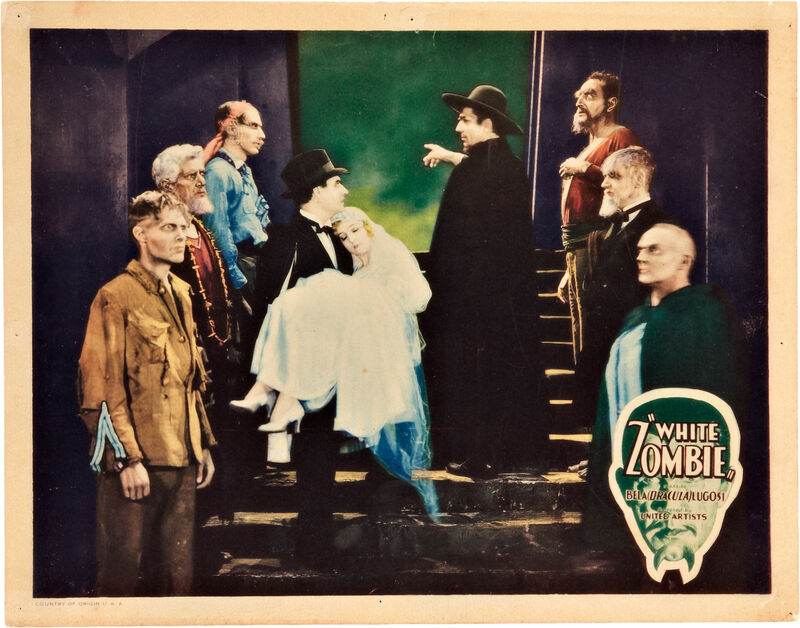 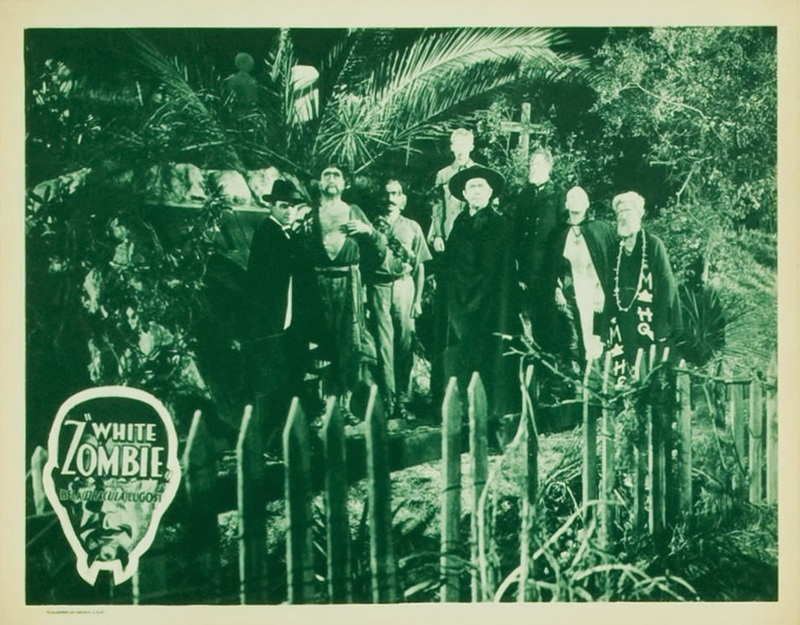 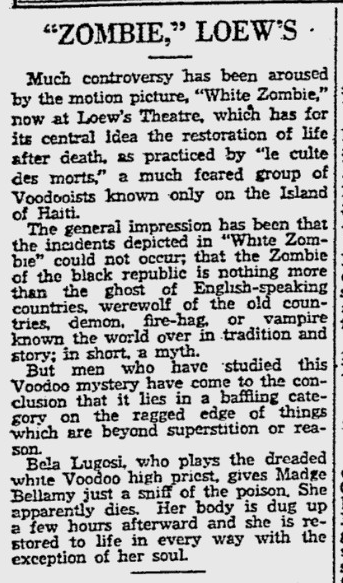 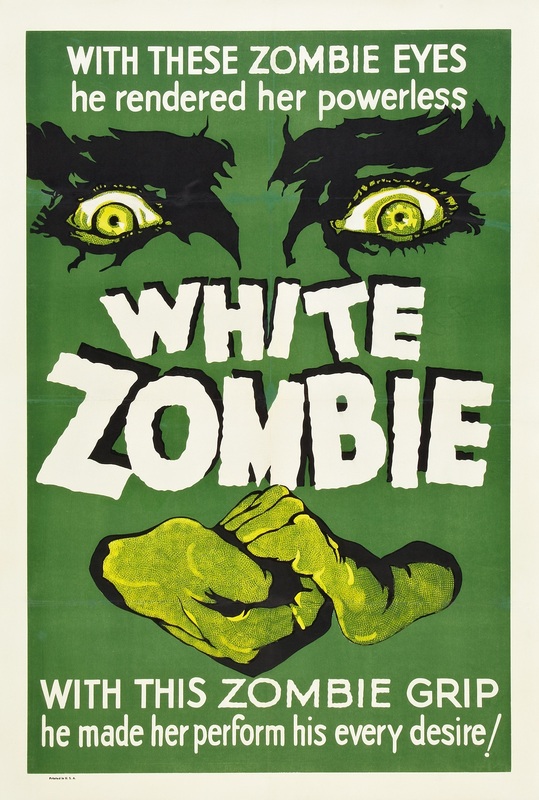 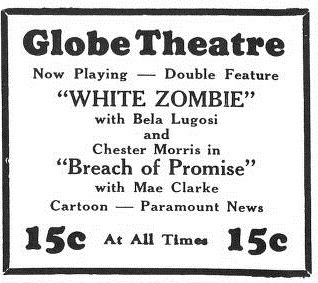 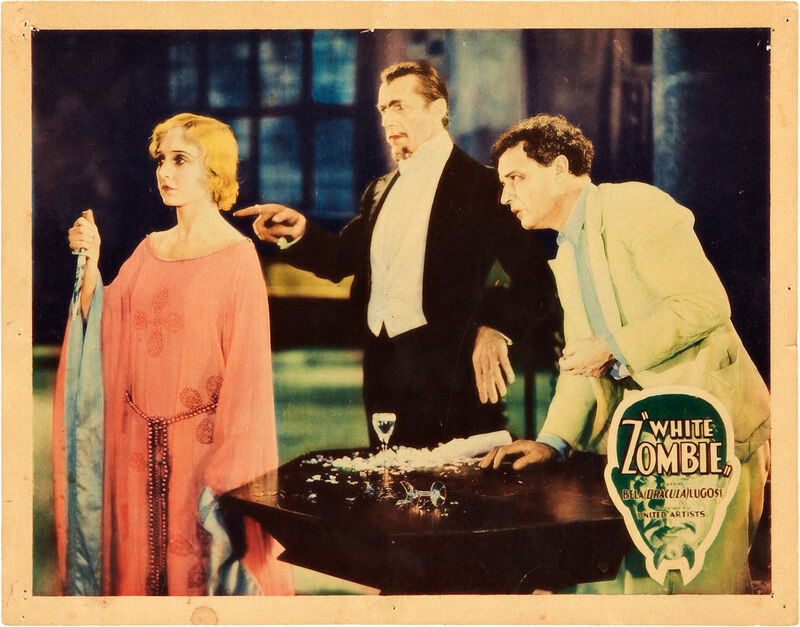 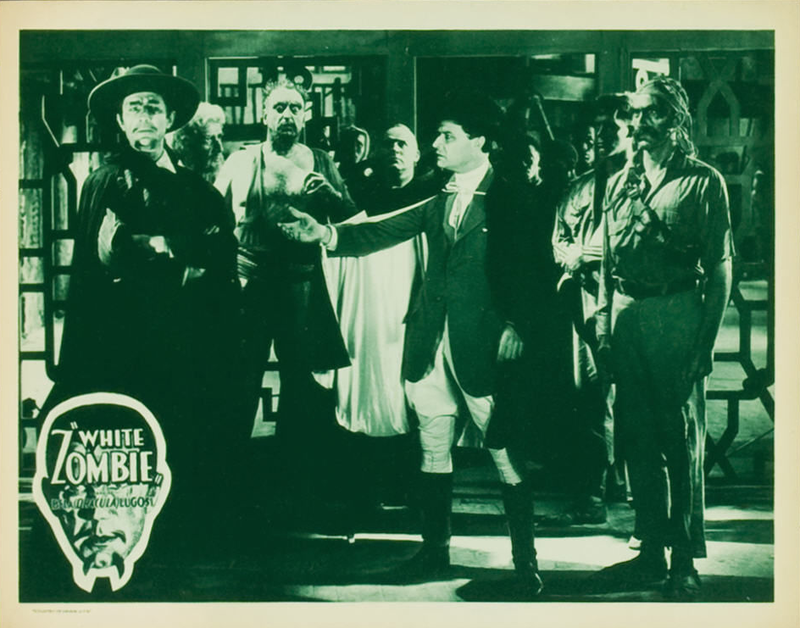 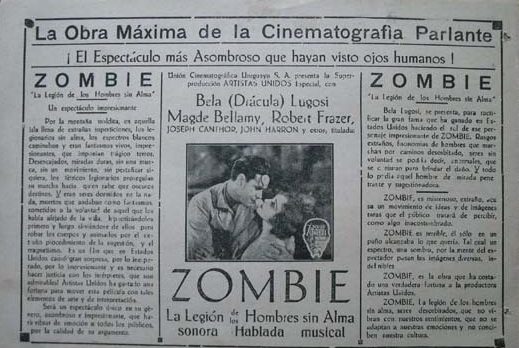 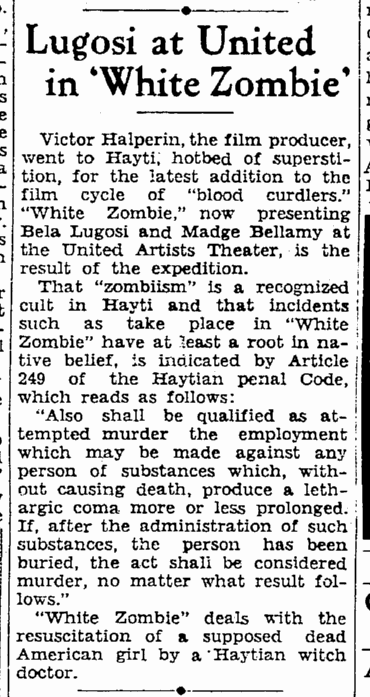 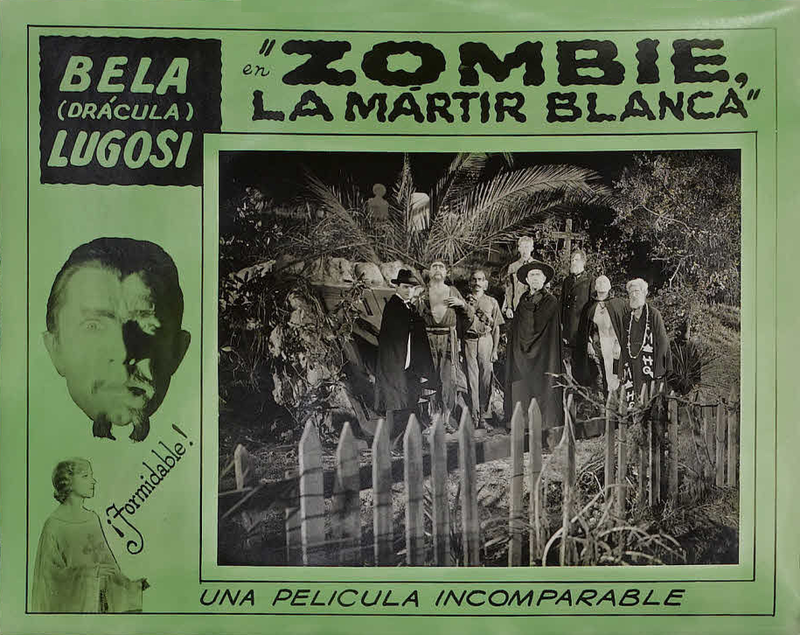 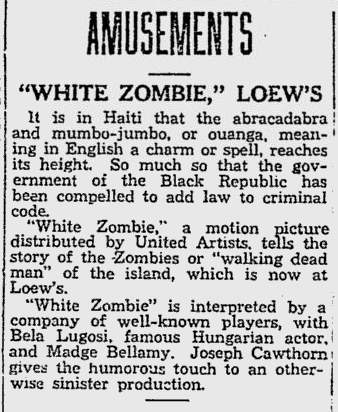 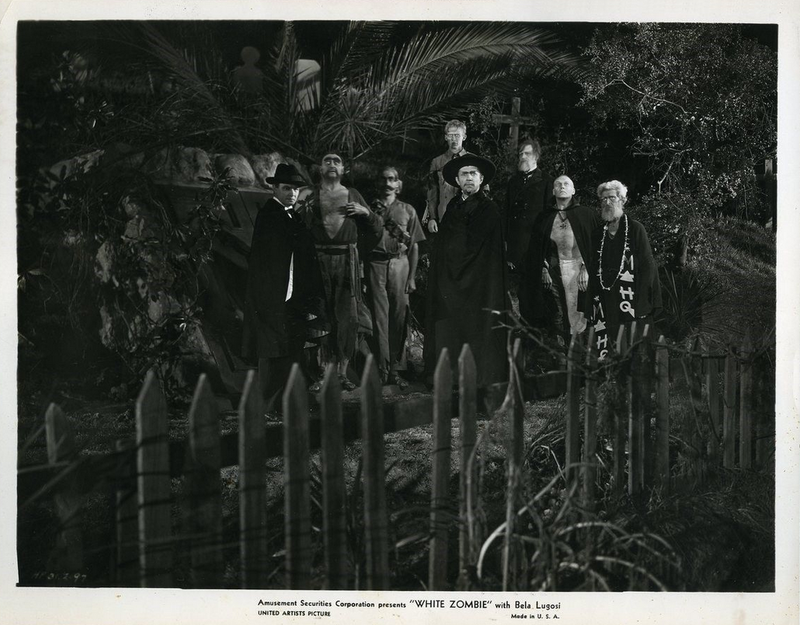 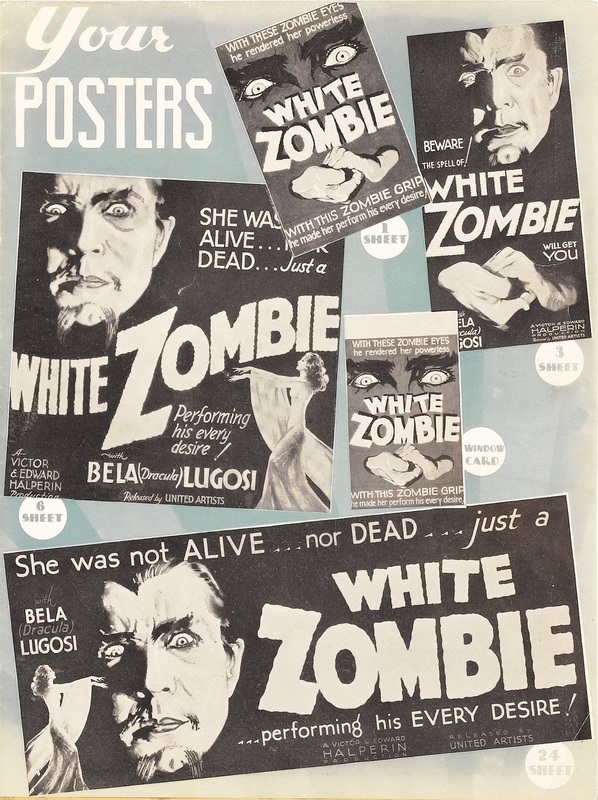 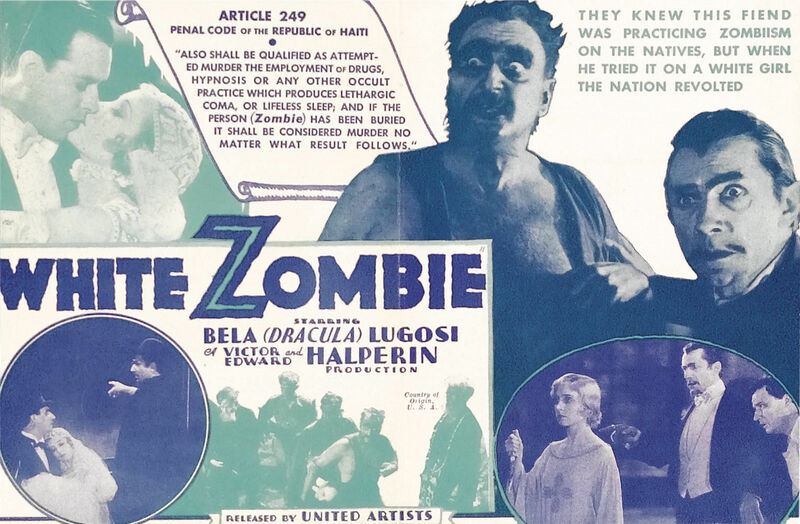 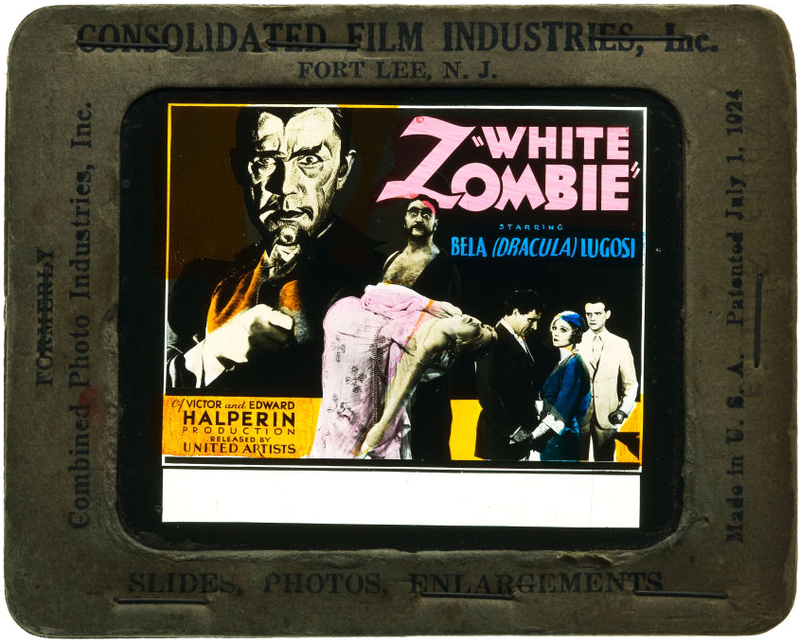 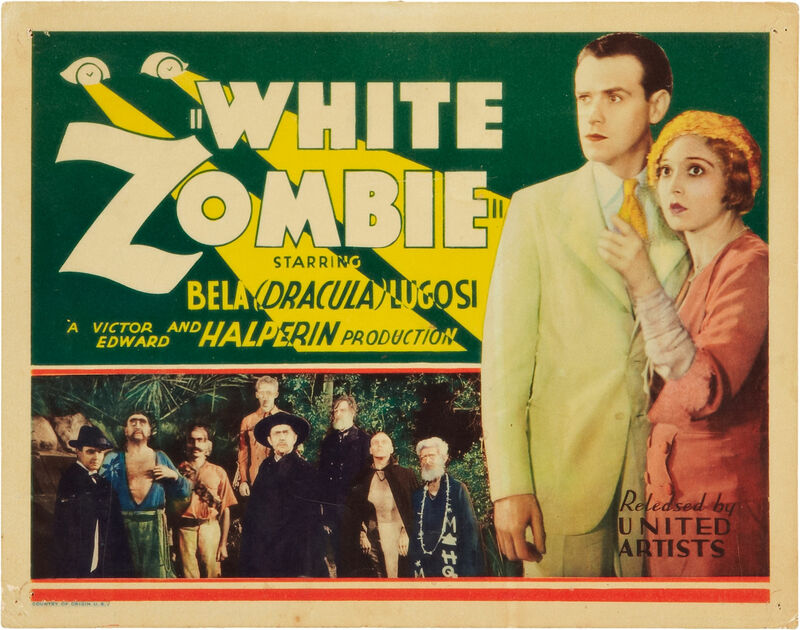 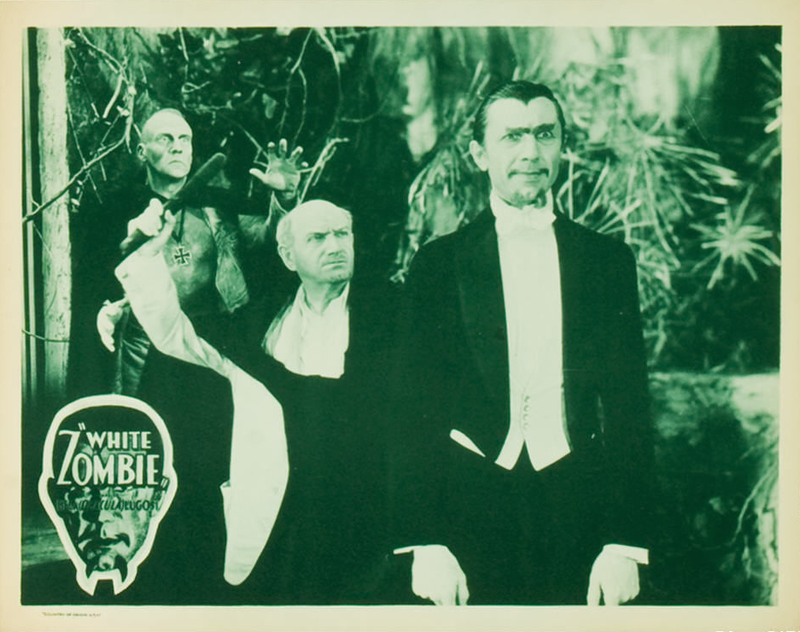 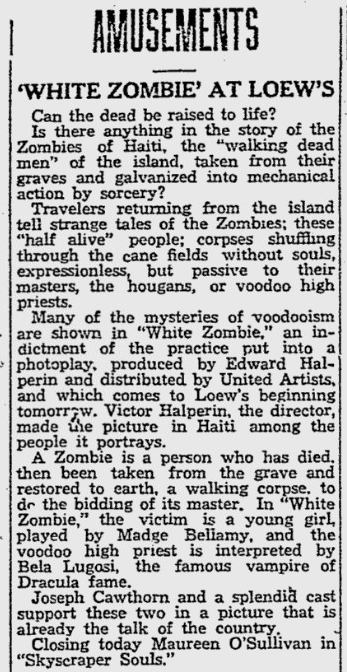 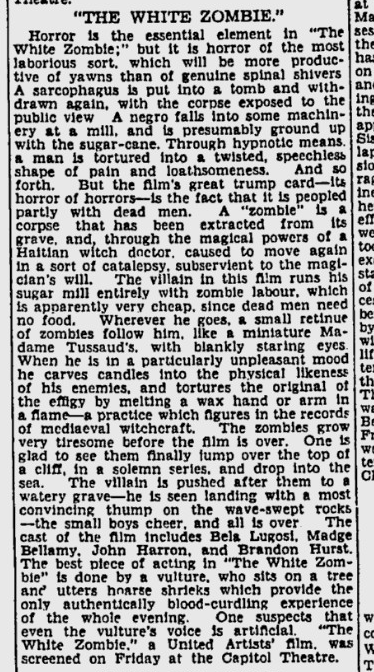 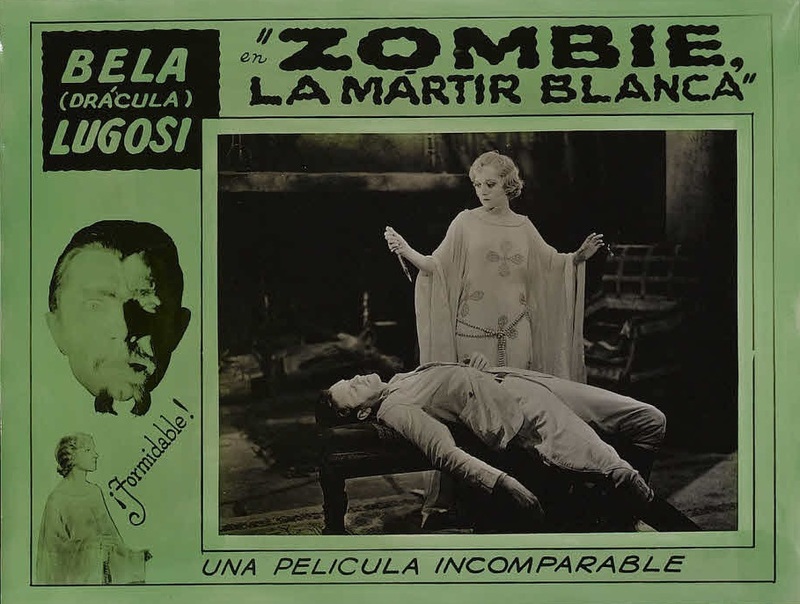 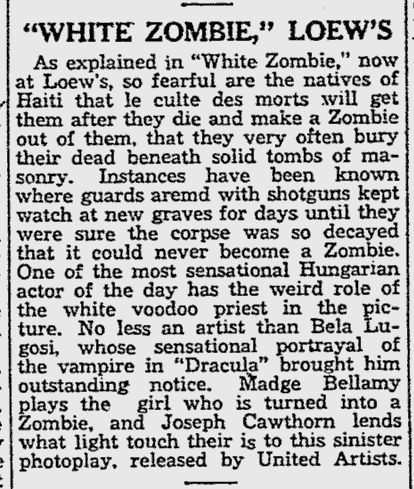 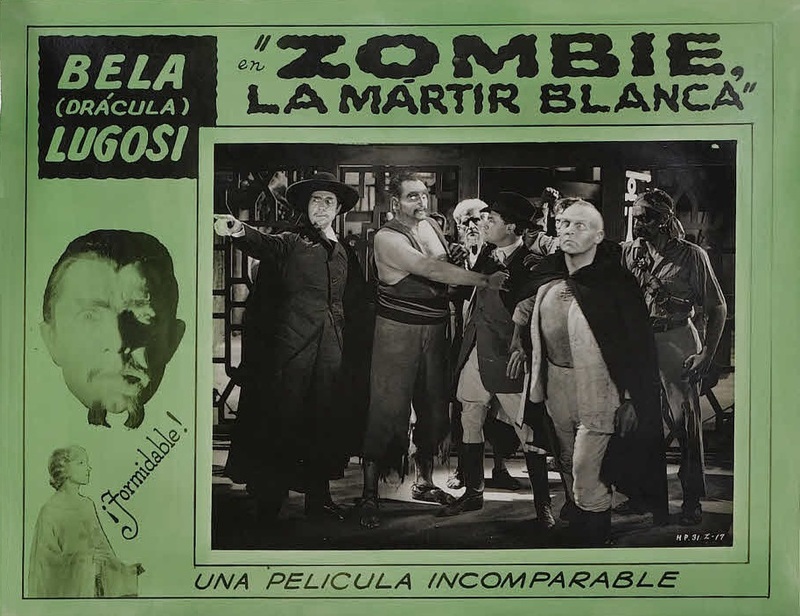 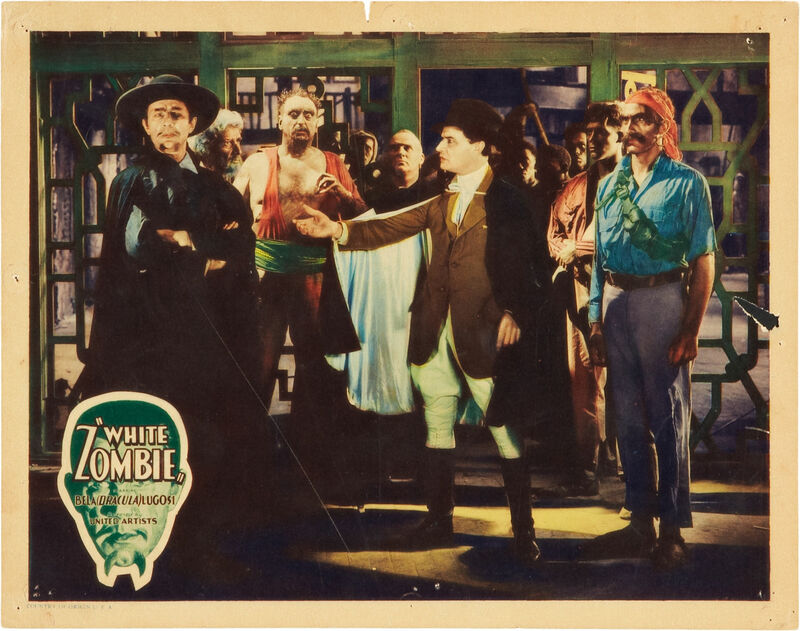 Based on William B. Seabrock’s travelogue The Magic Island, a book which contained “firsthand accounts of Haitian voodoo and witchcraft rituals,” White Zombie was the first film to bring the now familiar zombies to the screen. 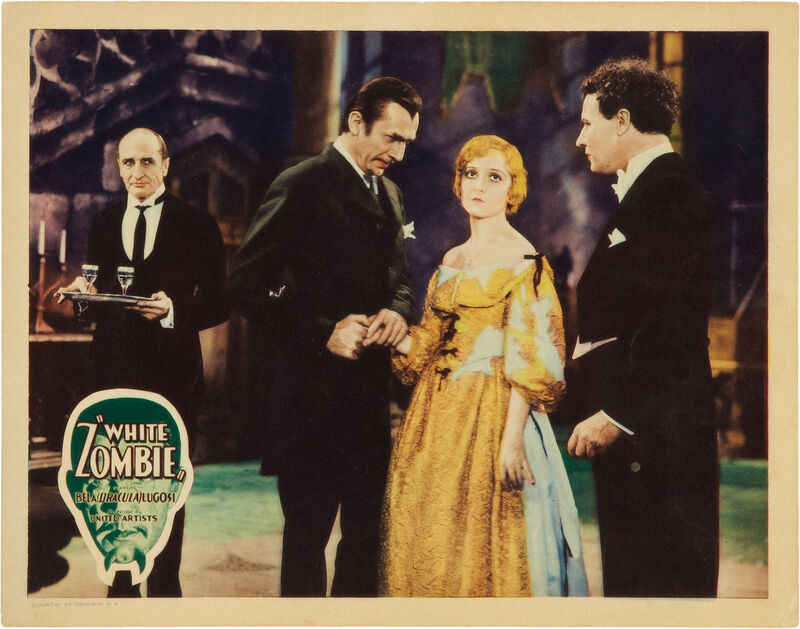 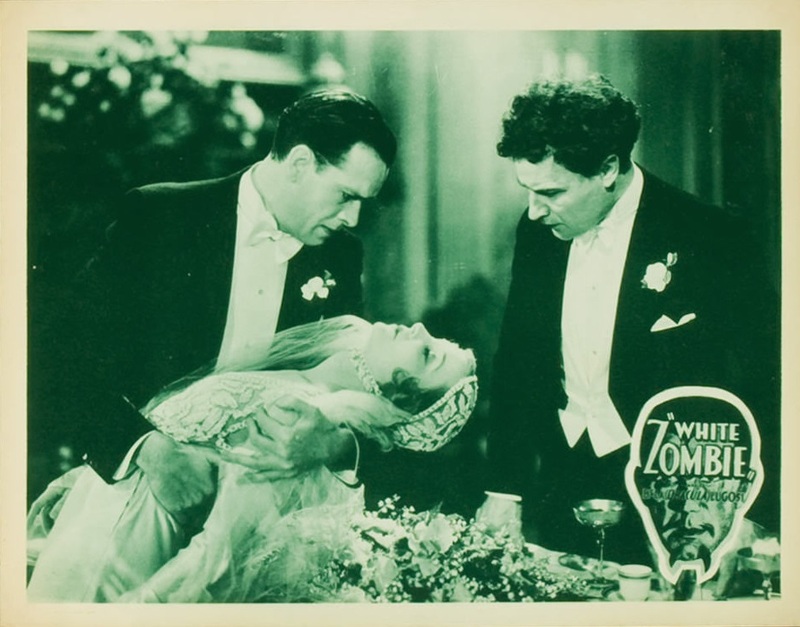 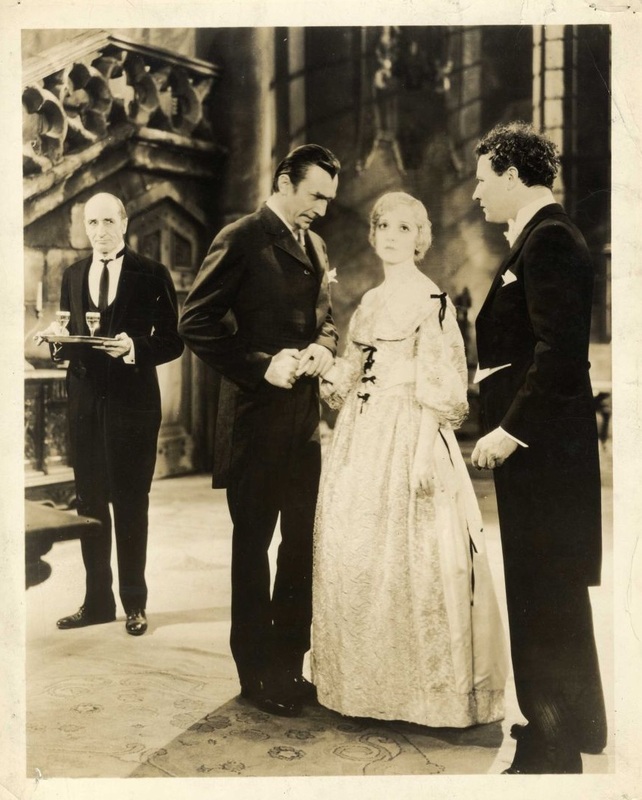 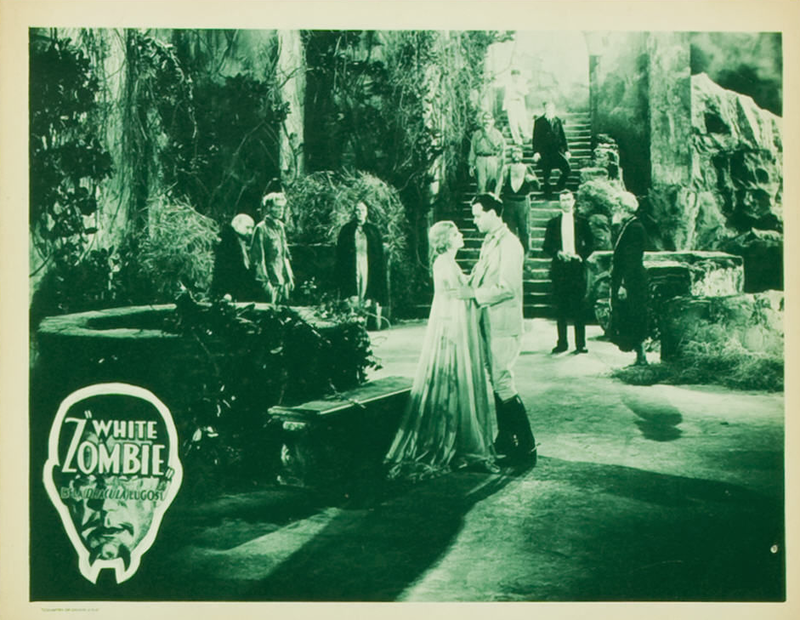 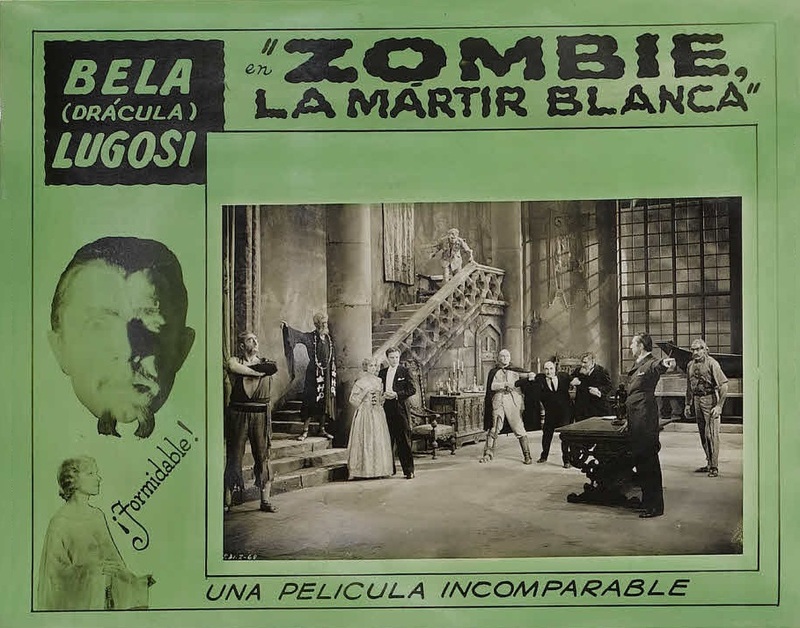 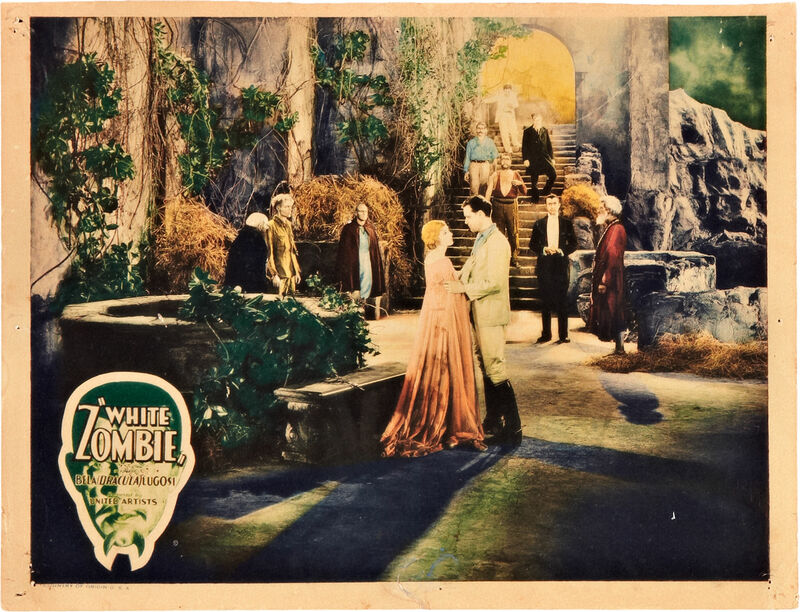 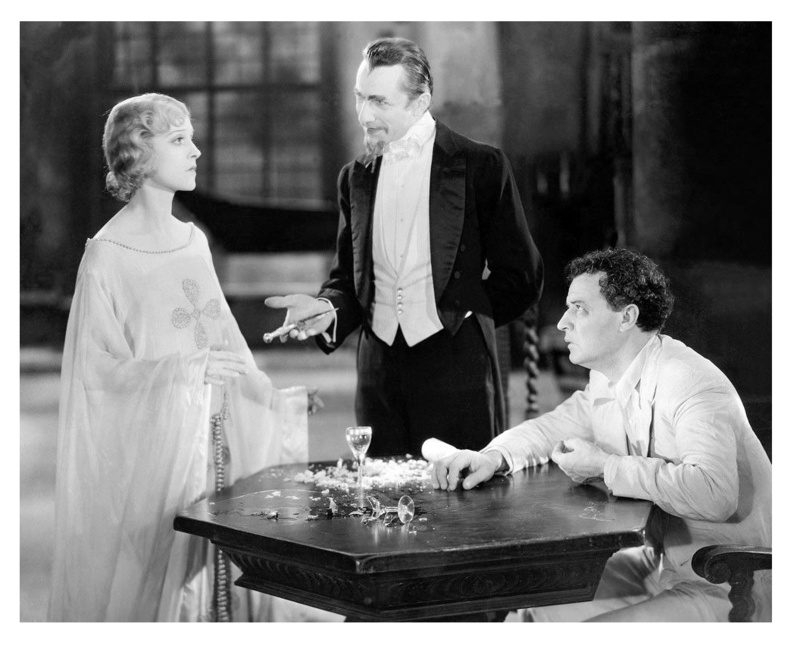 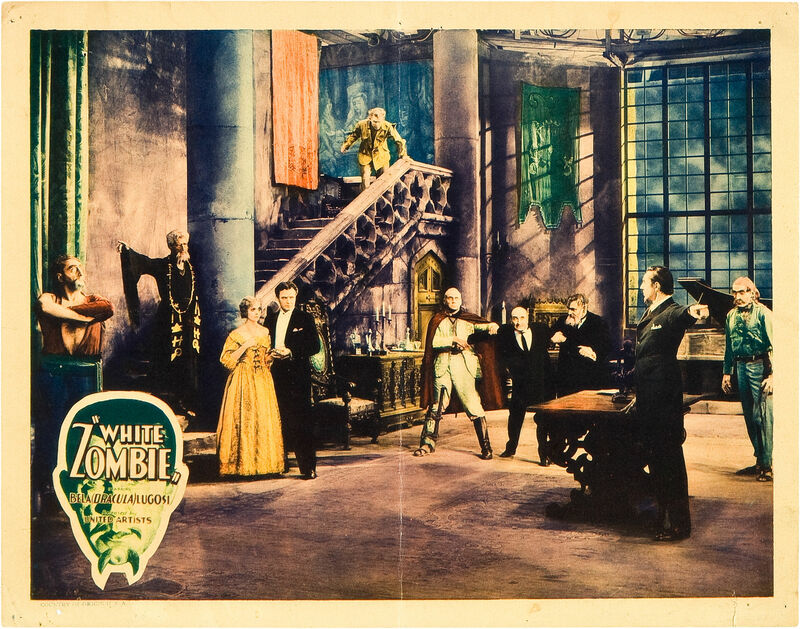 Shot on sets from Dracula and Frankenstein at Universal studios, with additional scenes filmed at RKO-Pathe, the low-budget film was a commercial success. 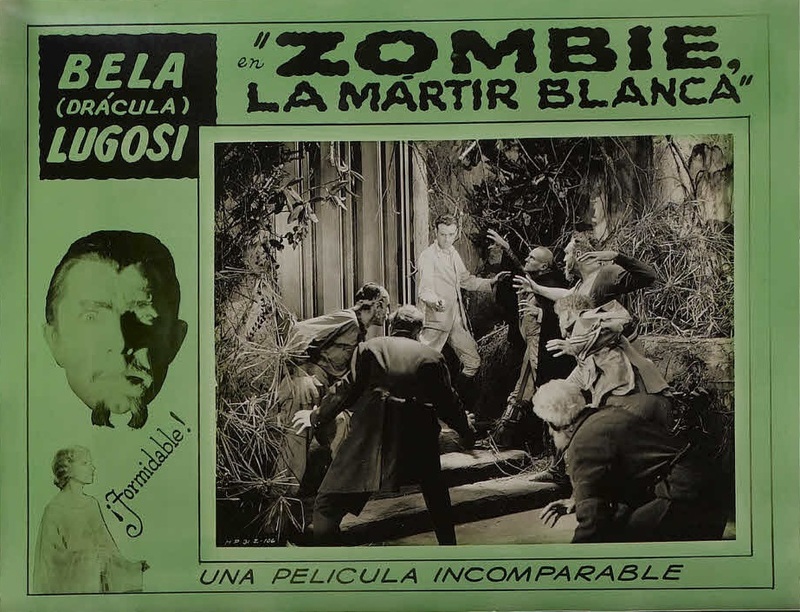 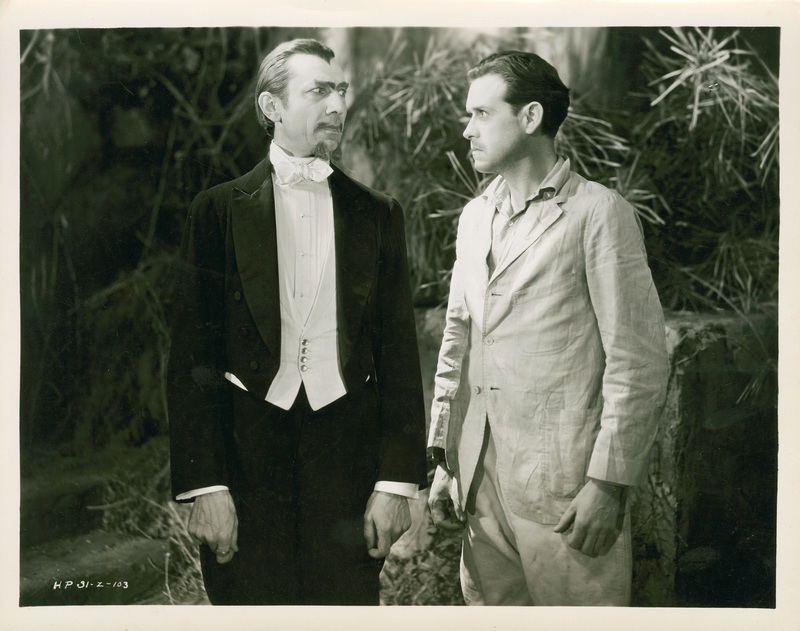 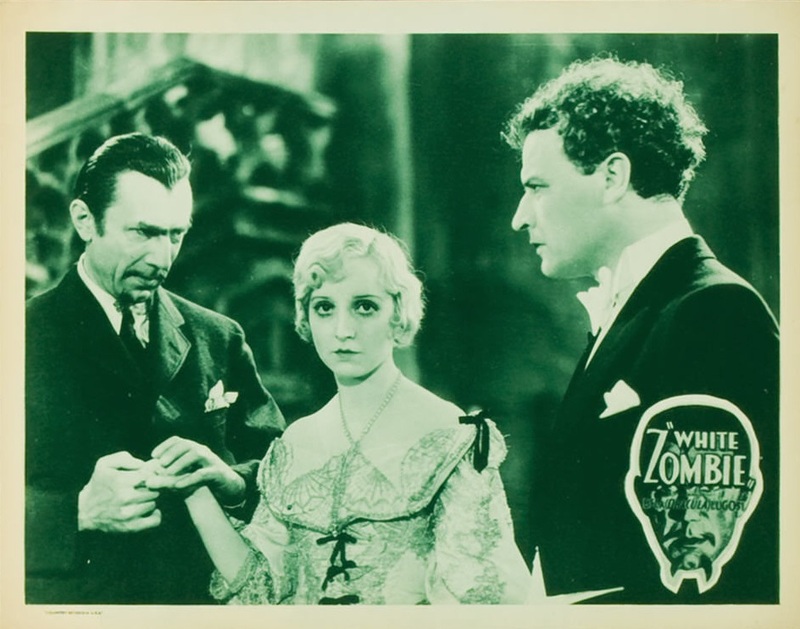 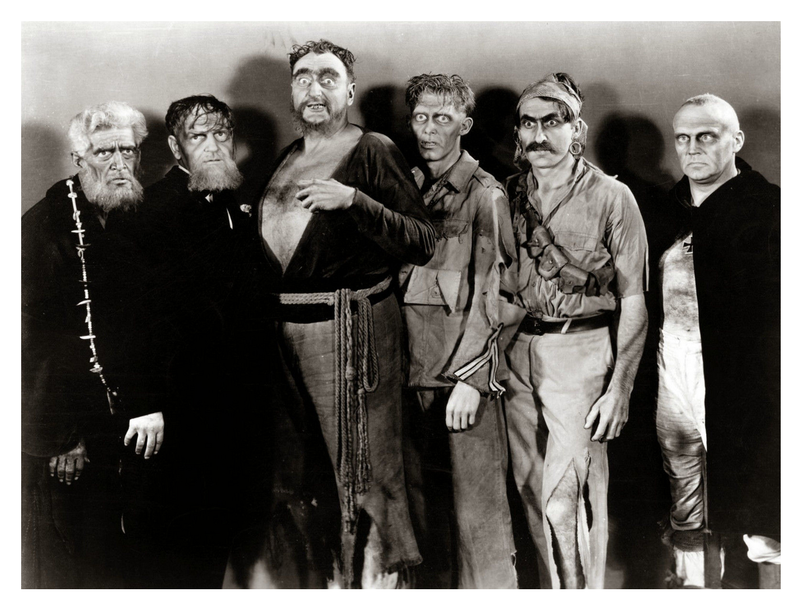 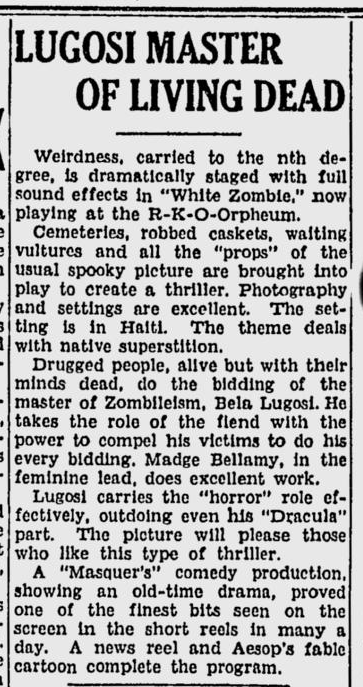 Lugosi’s role of zombie master ‘Murder’ Legendre was one of his most memorable. 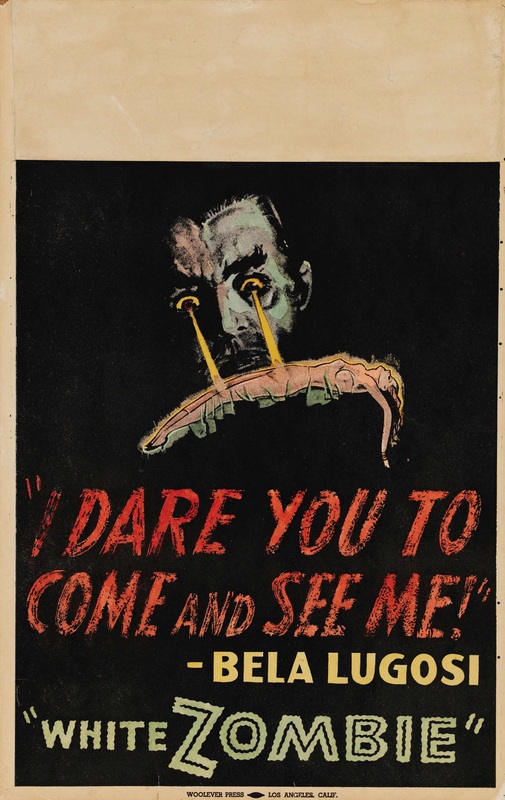 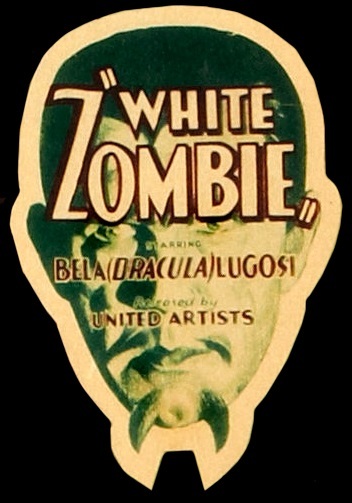 Close-ups of Lugosi’s eyes, recycled from White Zombie, were used in a less-successful 1936 sequel, Revolt of the Zombies. 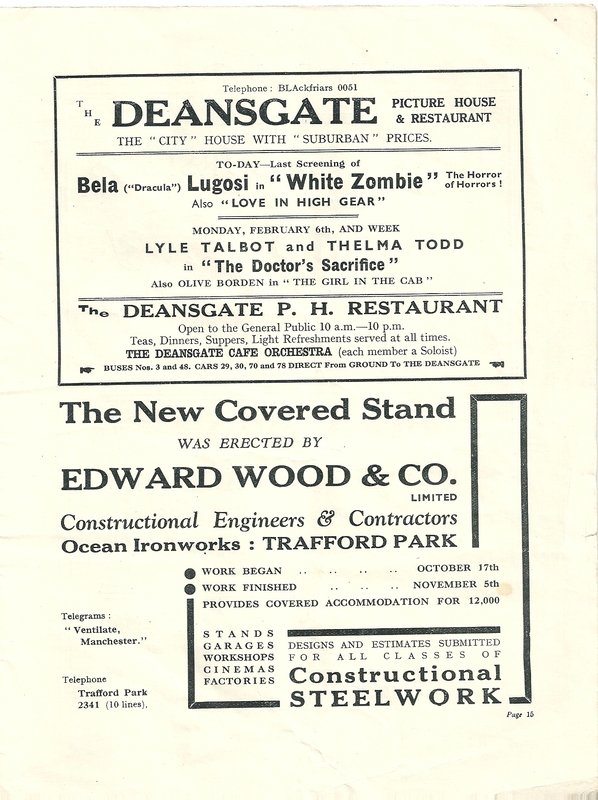 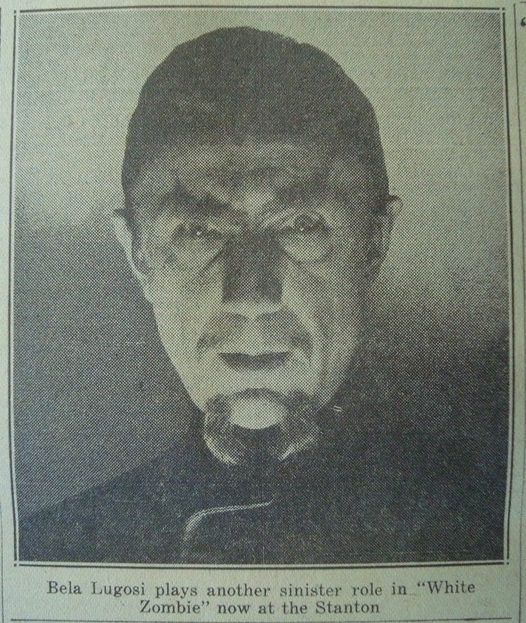 The film was to have starred Lugosi, but his role was eventually taken by Dean Jagger. 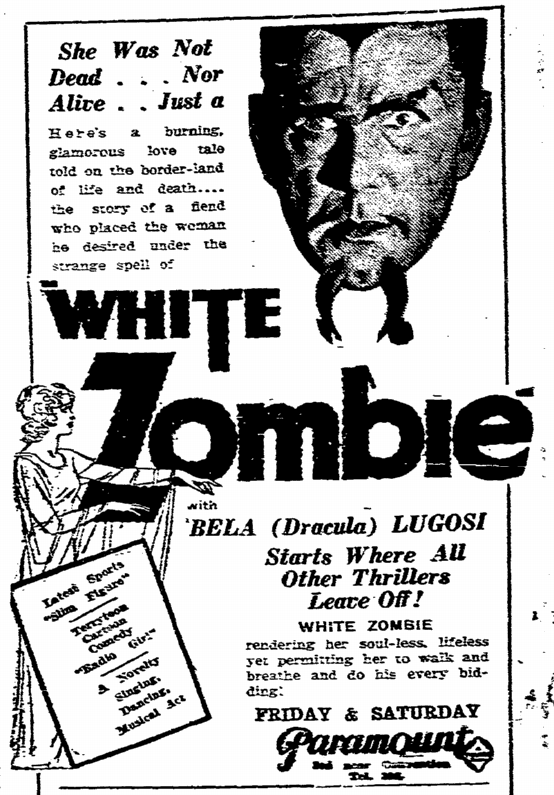 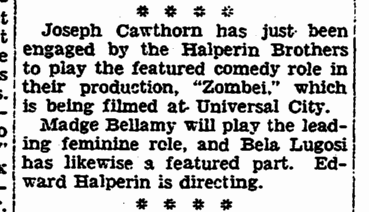 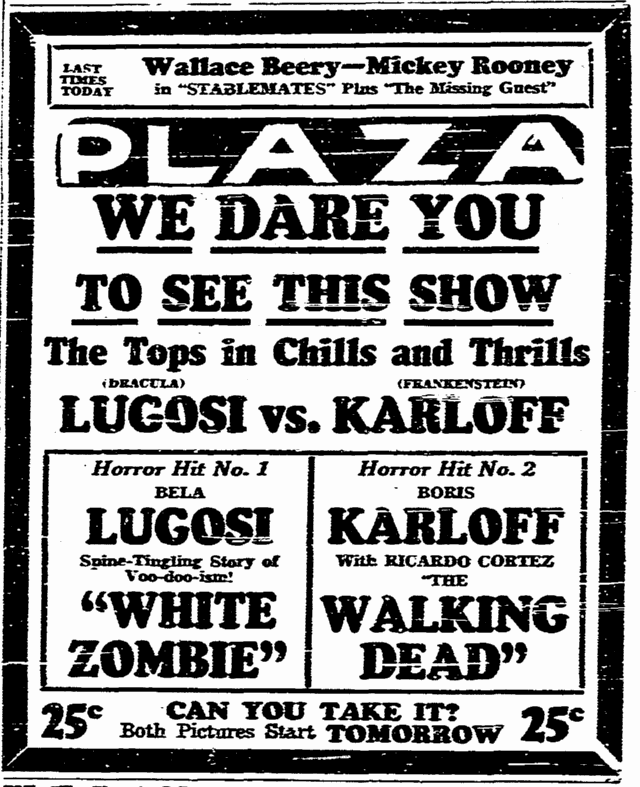 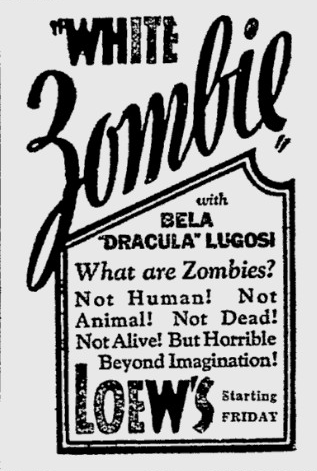 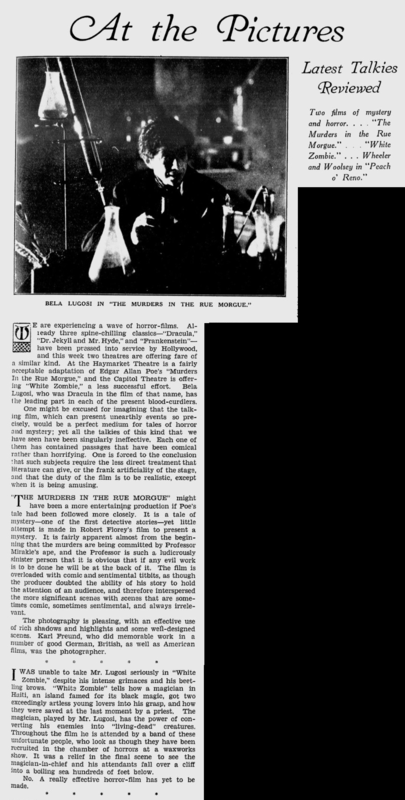 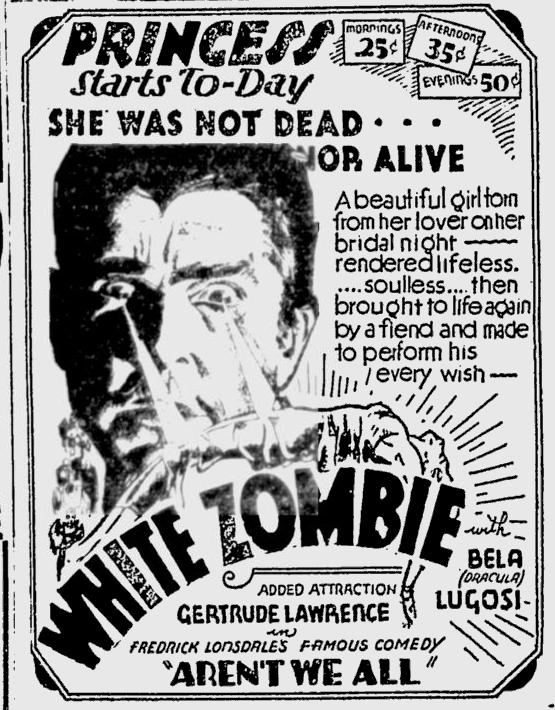 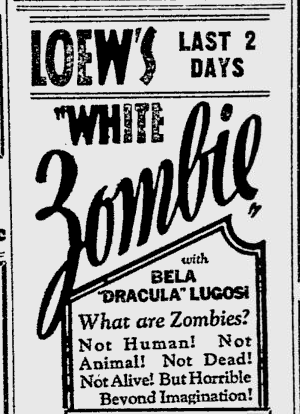 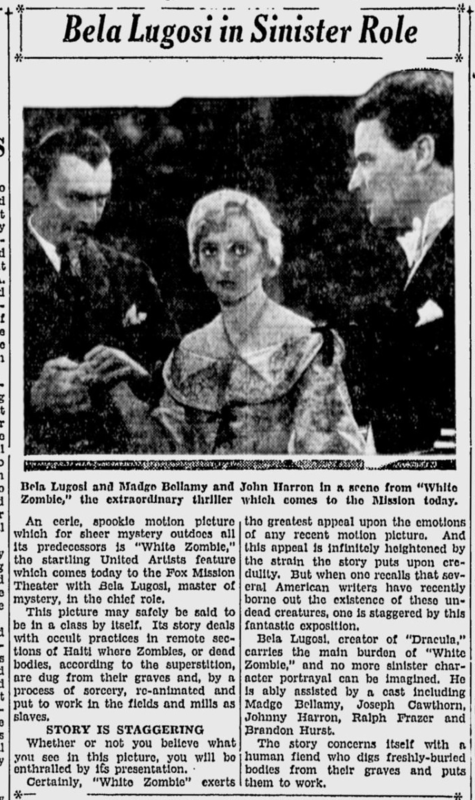 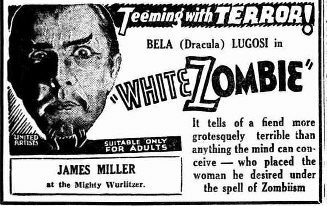 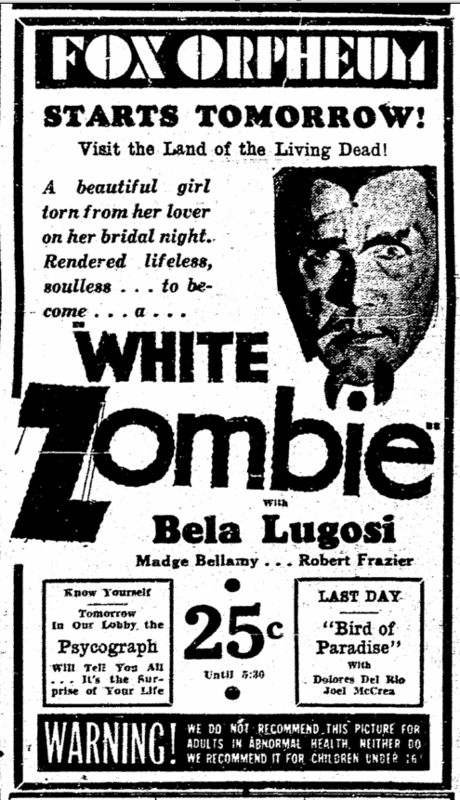 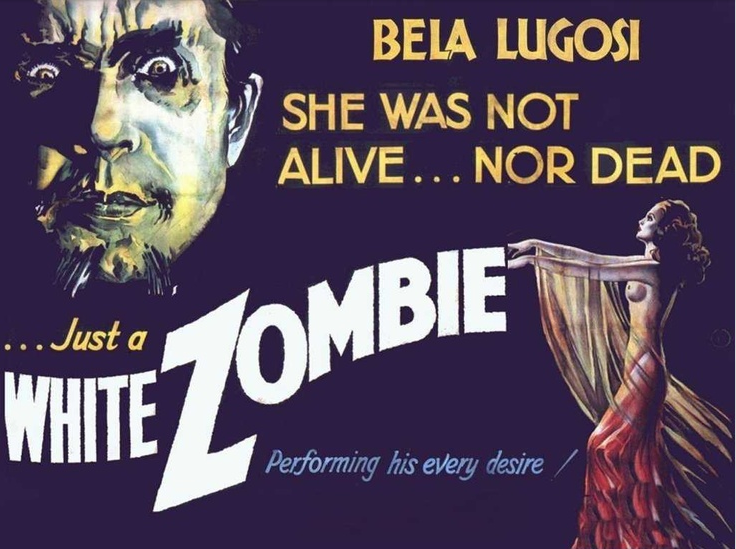 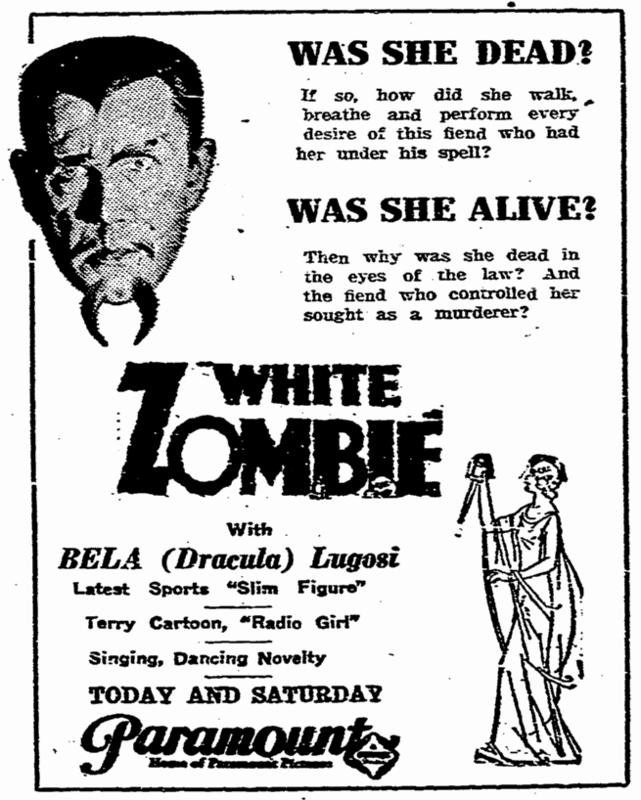 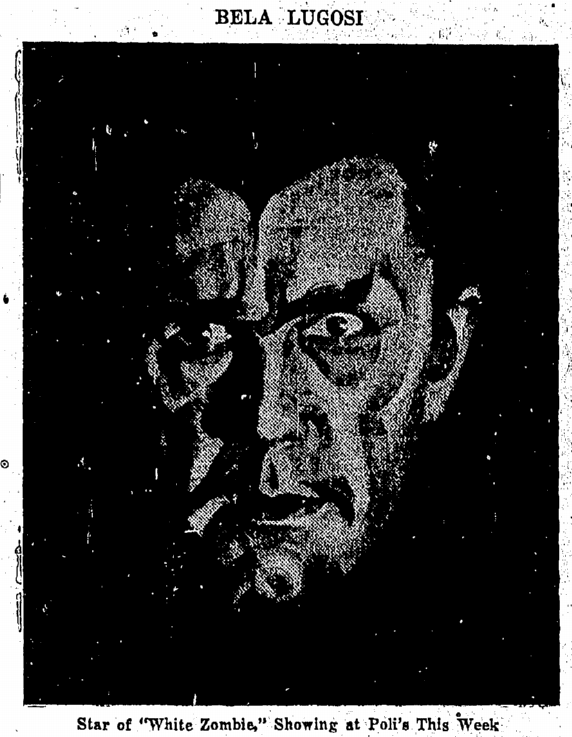 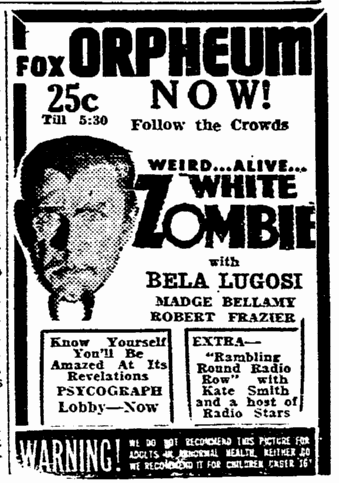 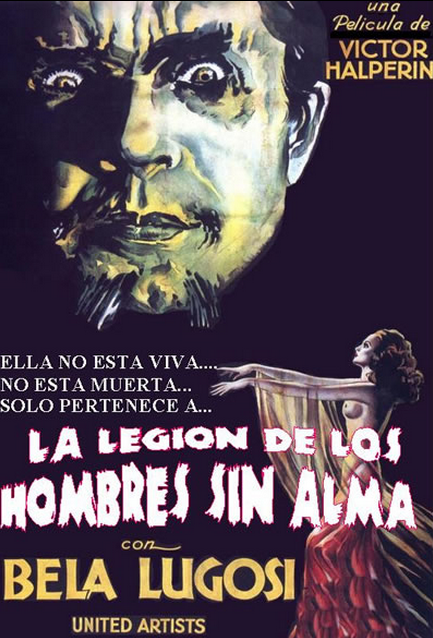 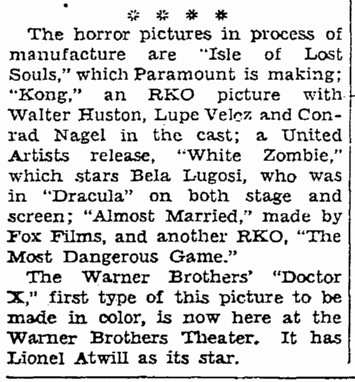 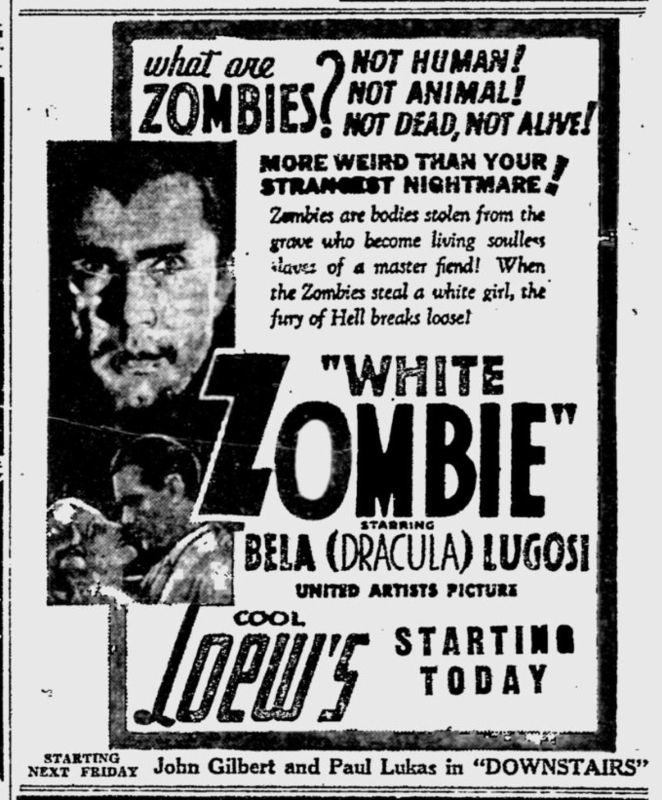 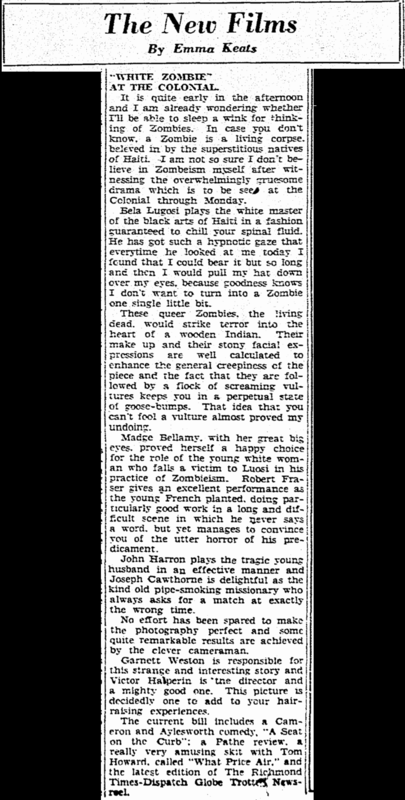 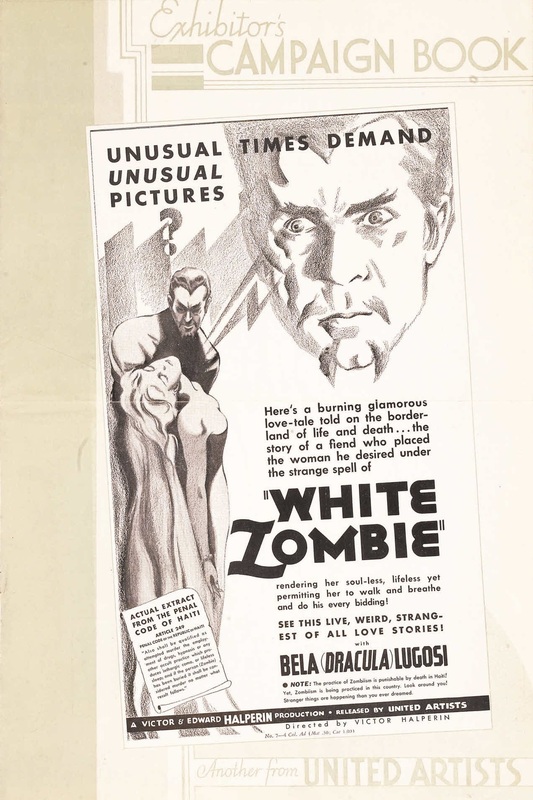 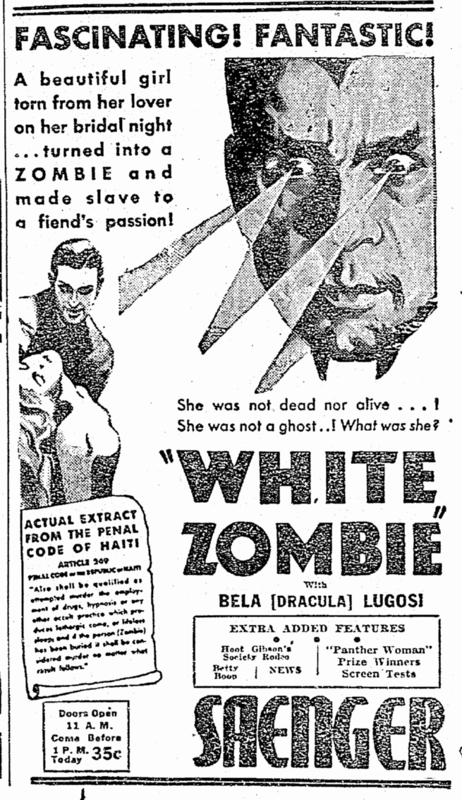 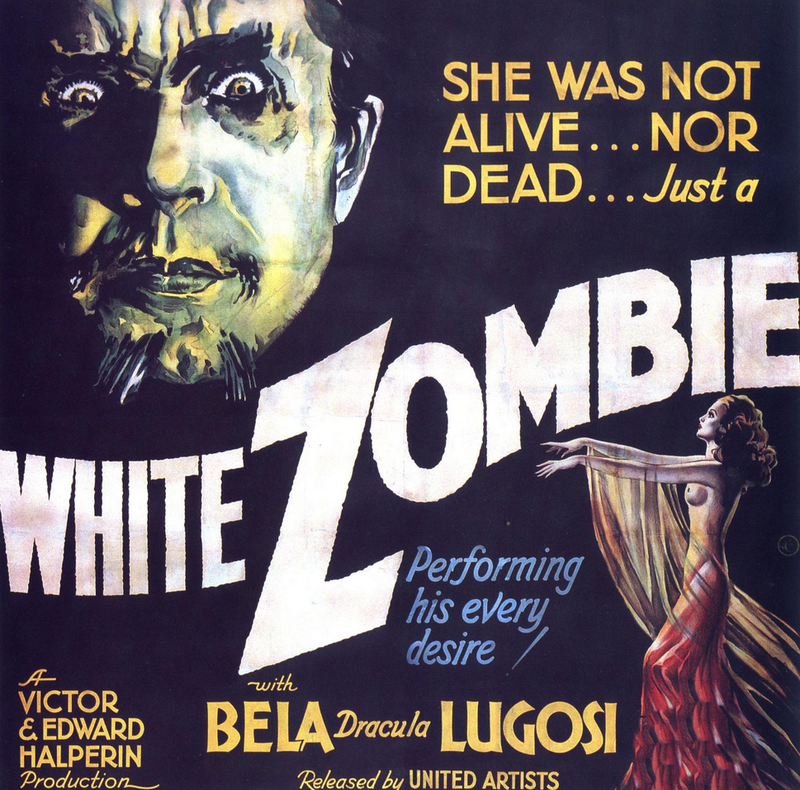 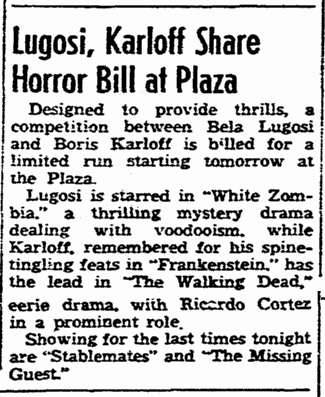 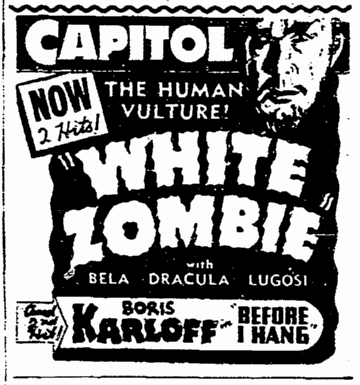 Lugosi himself announced a second sequel, Return of the White Zombie, in the 1950s, but the film was never made. 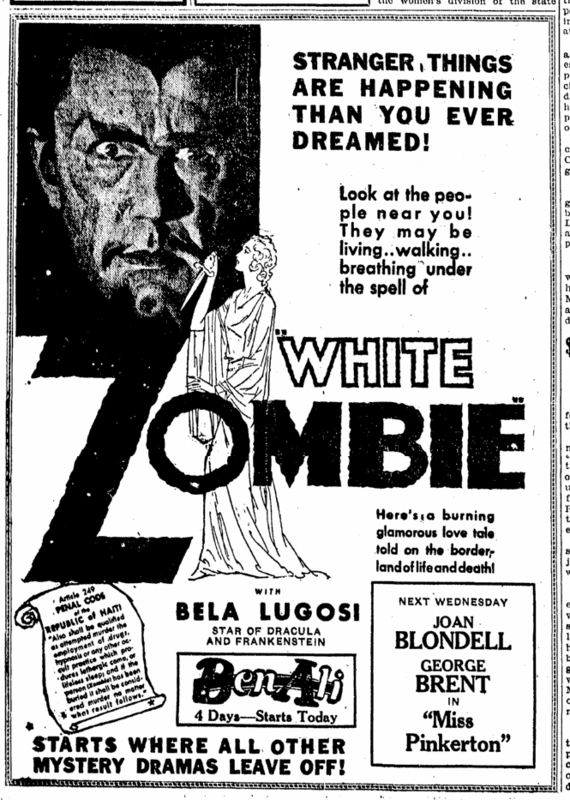 In 1942 Bela Lugosi was reunited with fellow White Zombie actors Clarence Muse in Invisible Ghost (1941) and Robert Frazer in Black Dragons (1942). 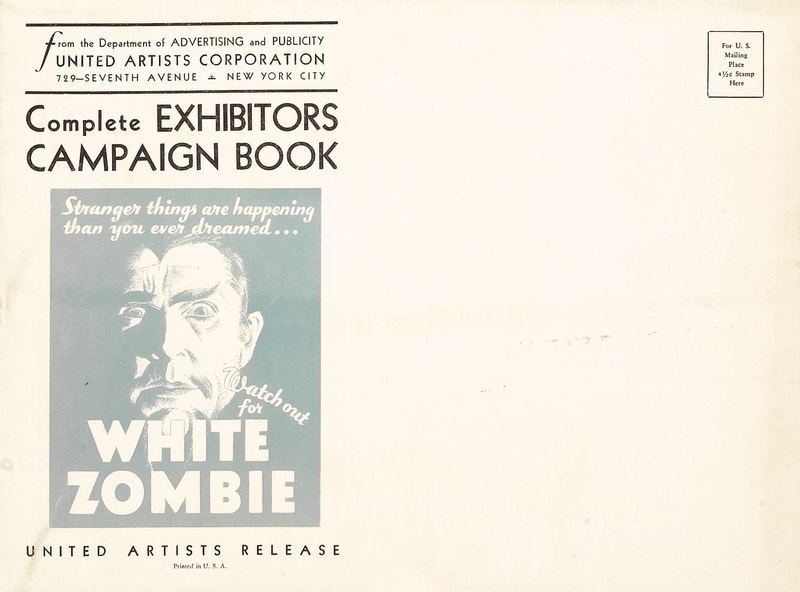 Production Company: Amusement Securities Co., Ltd. 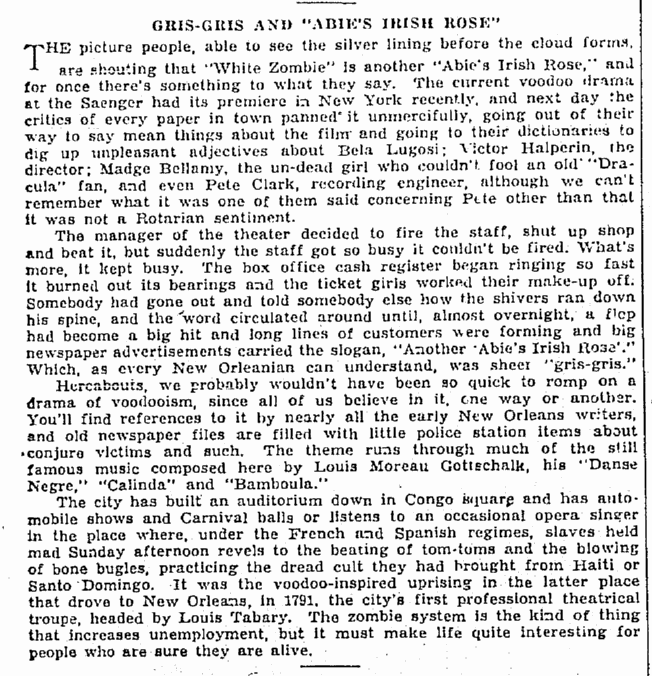 Within the past month a picture opened at the Rivoli on Broadway and was panned as “Abie’s Irish Rose” had been panned. 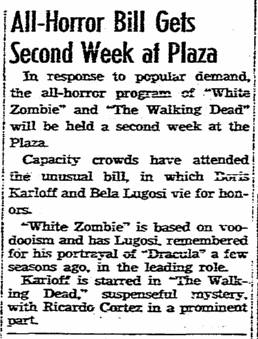 But the public flocked, regardless. 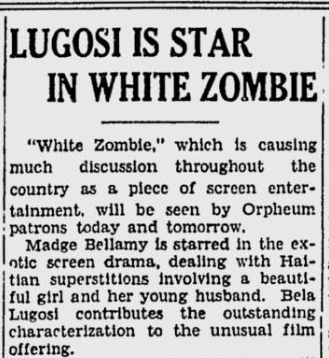 And kept on flocking until New York in particular and the county in general realized that the screen had a new sensation. 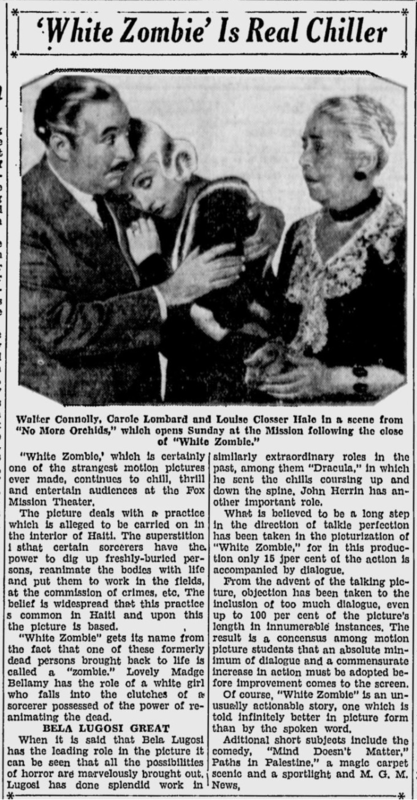 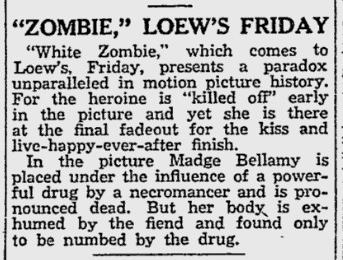 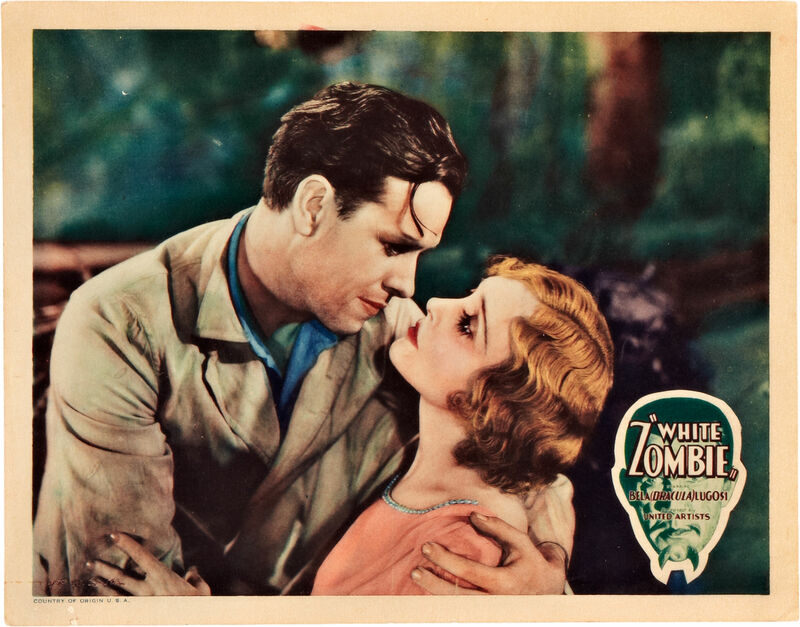 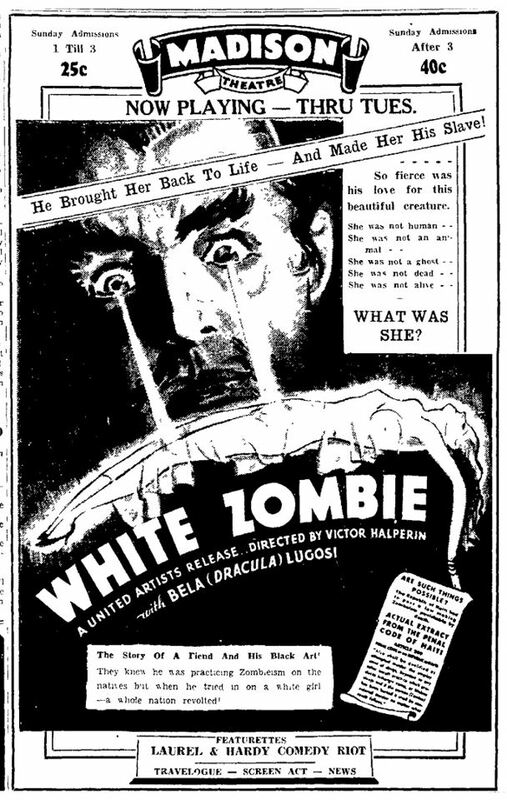 That sensation is “White Zombie.” Clan analysis reveals that there is nothing strange about the public clamor for “White Zombie.” It is the first picture in ages with a theme never before used for the screen, and its plot is motivated by superstition and manifestations of the supernatural. 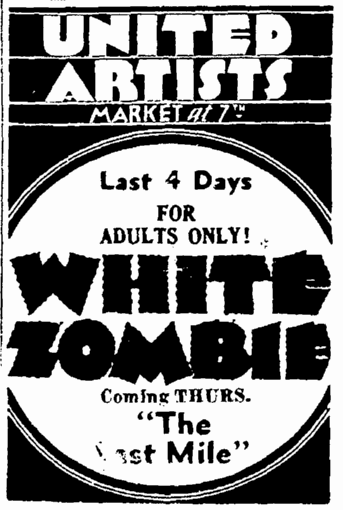 “White Zombie” is coming to this city to be exhibited at Ritz Theatre. 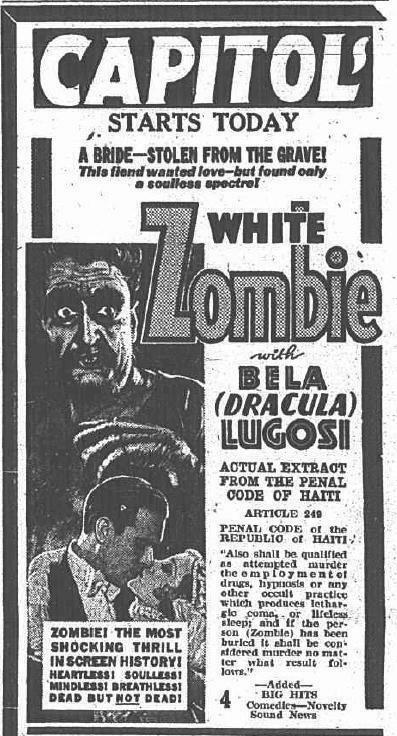 Said to be more spooky and fantastic than “Dracula” and “Frankenstein,” it promises the ultimate in thrills. 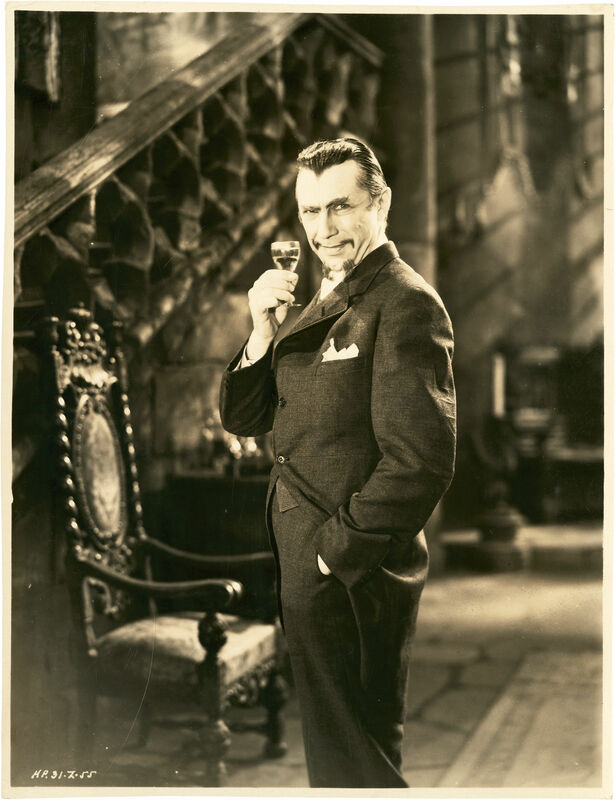 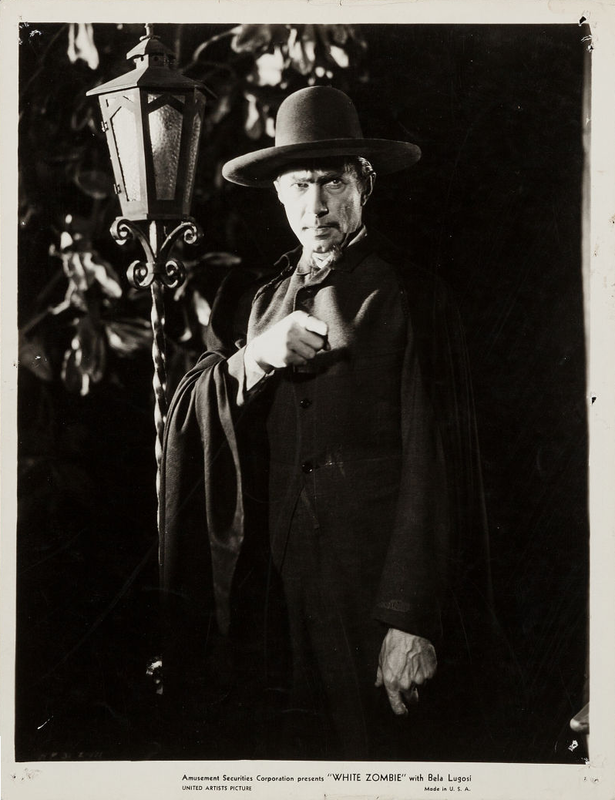 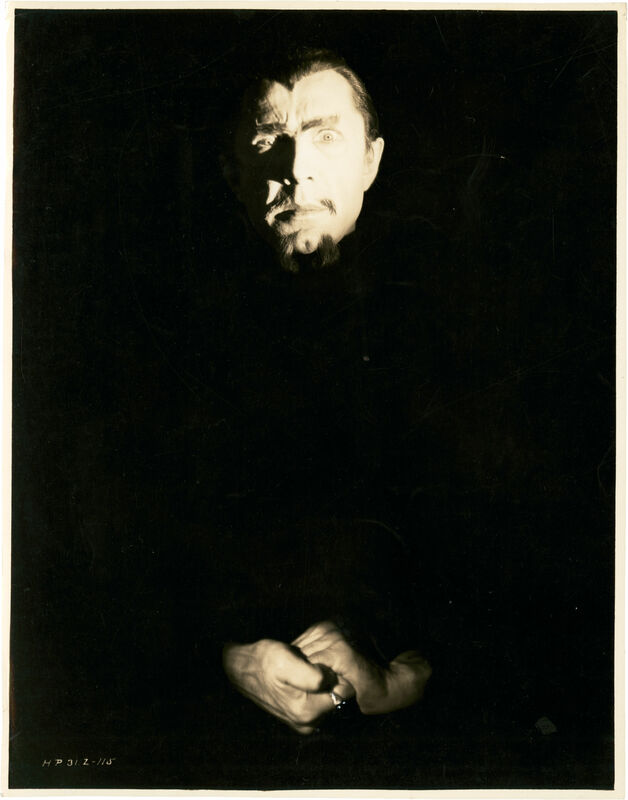 Bela Lugosi (the “Dracula” of screen and stage) plays the leading role. 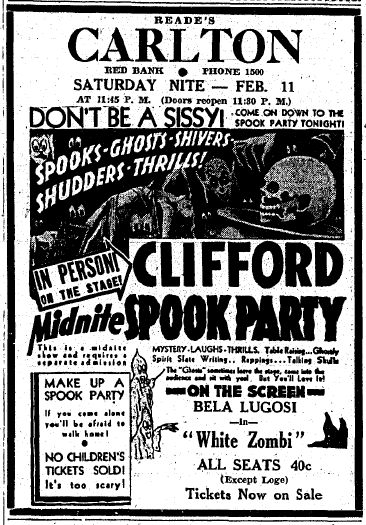 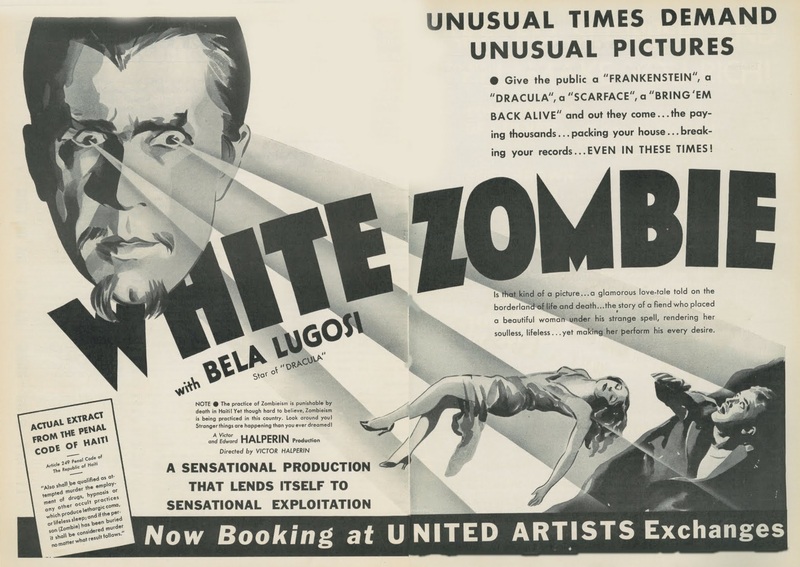 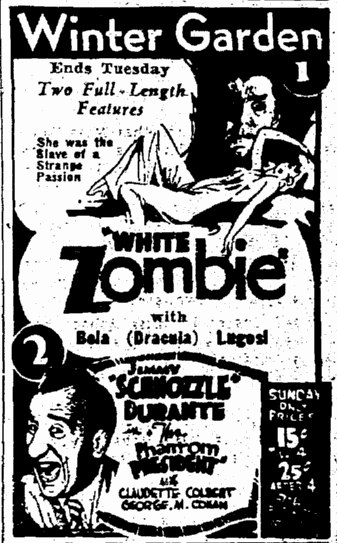 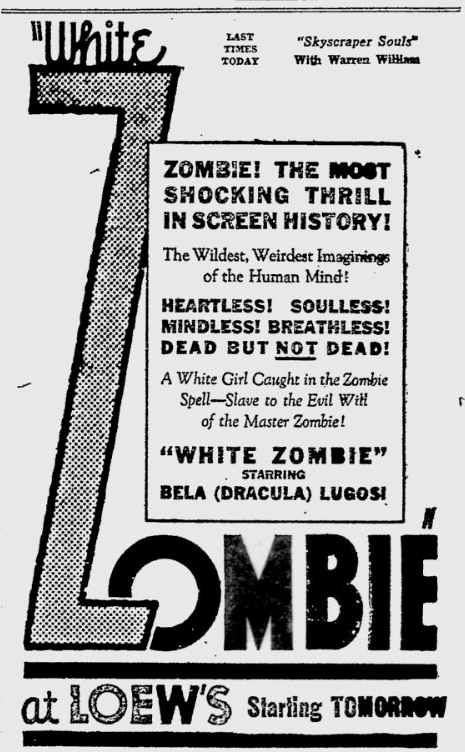 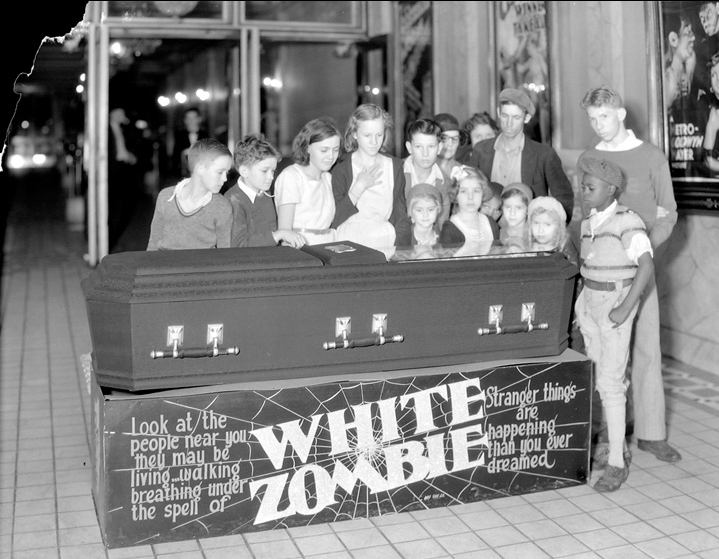 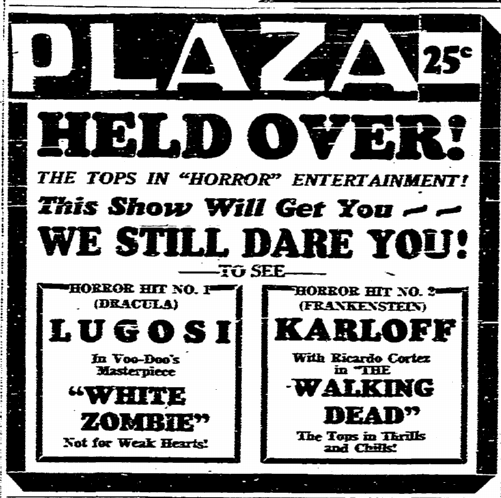 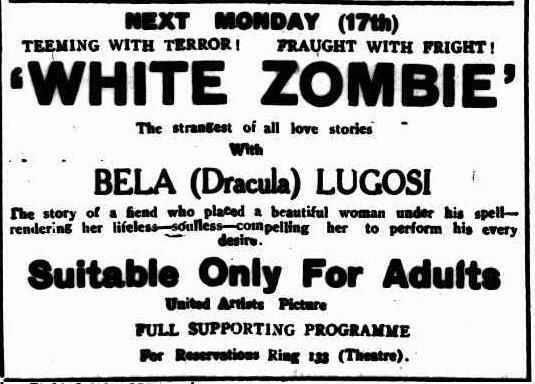 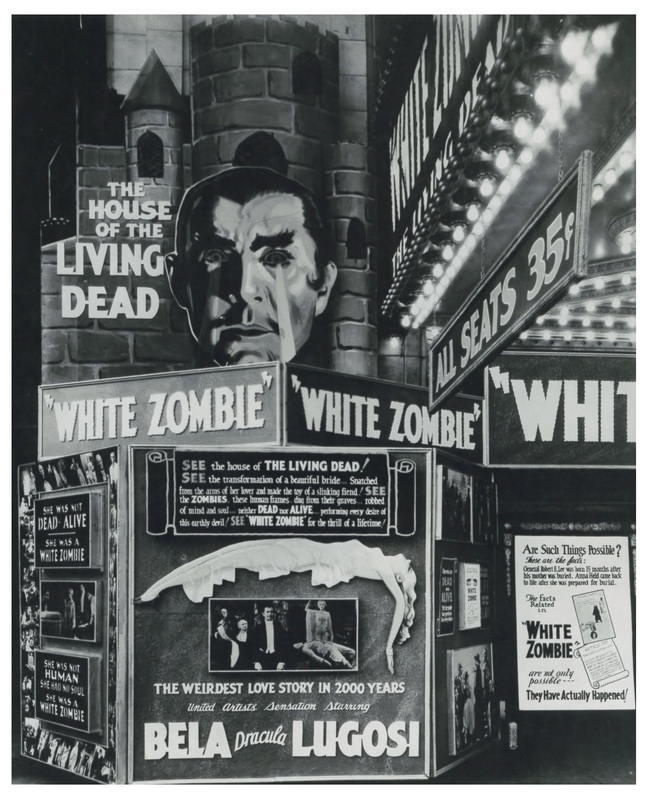 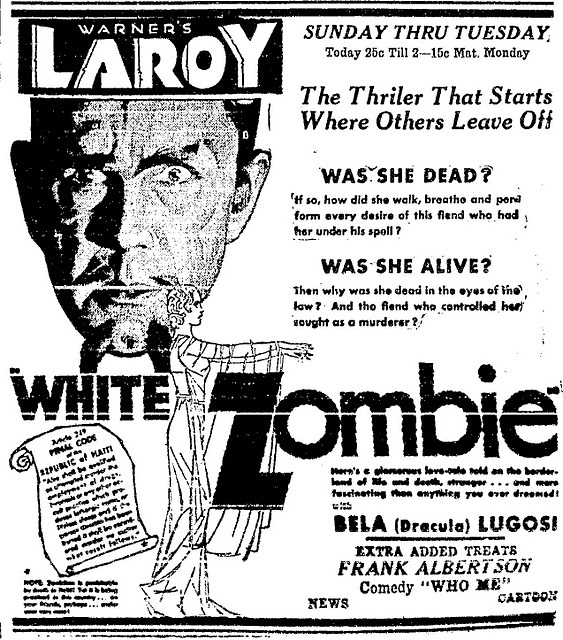 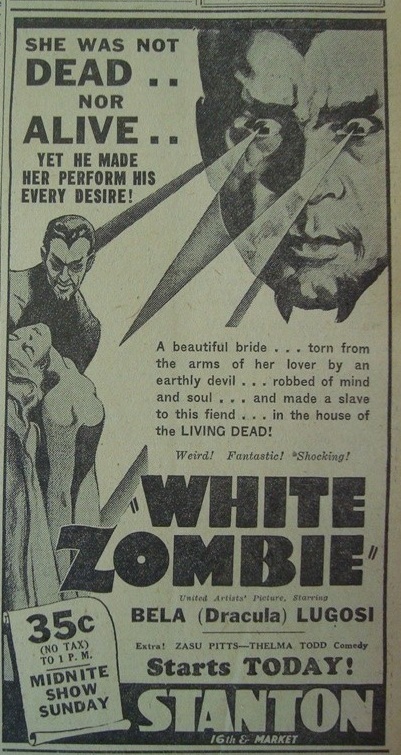 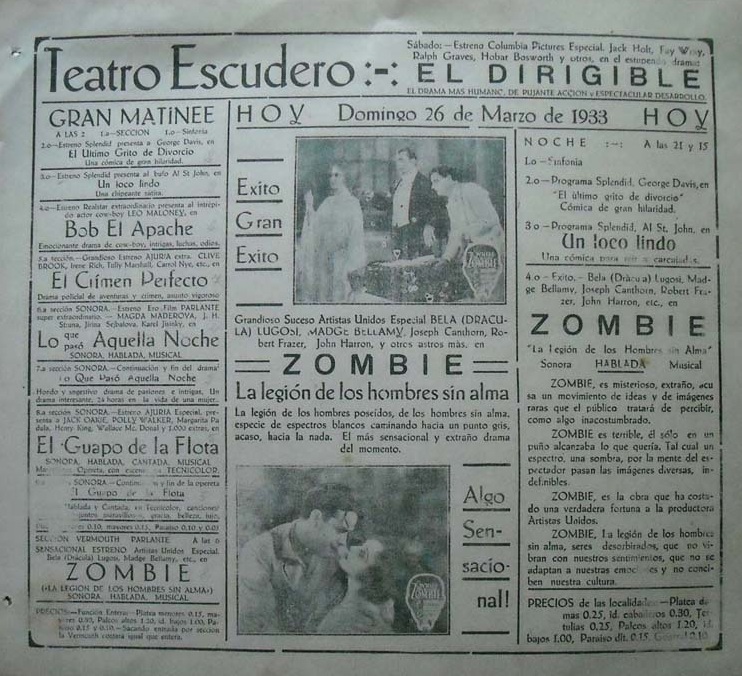 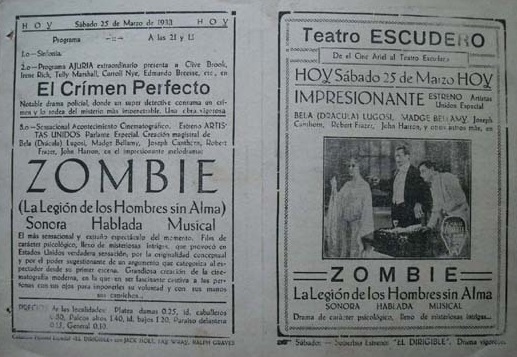 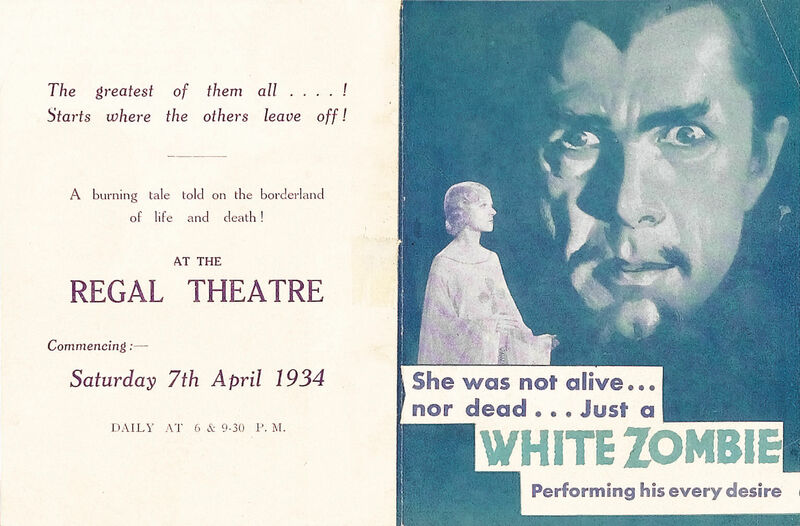 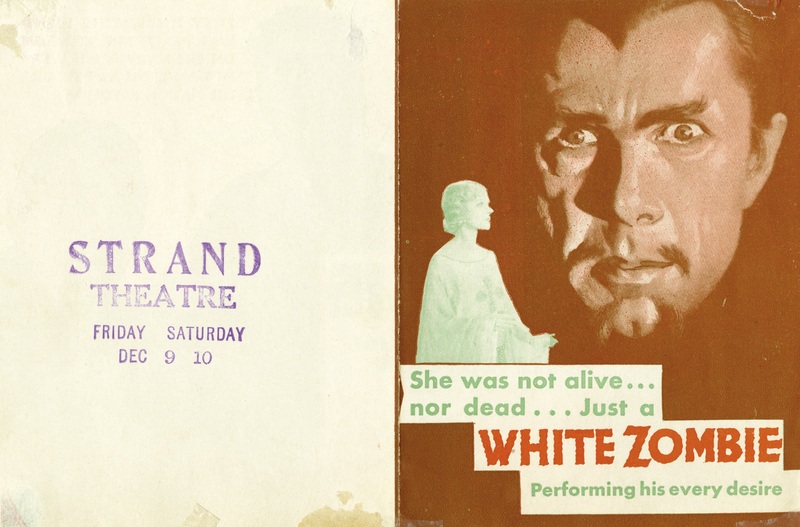 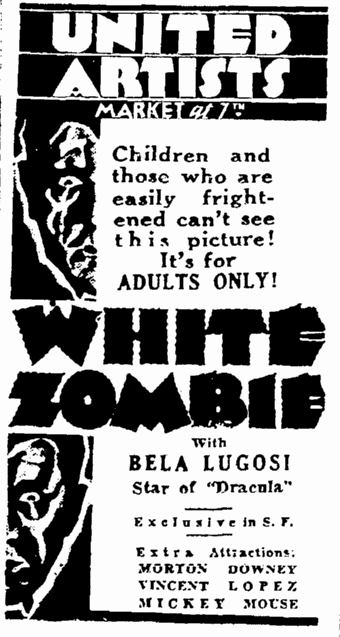 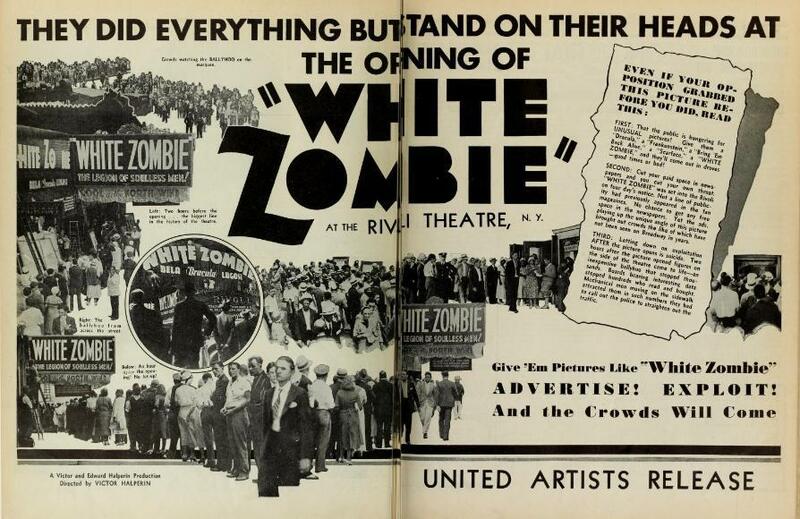 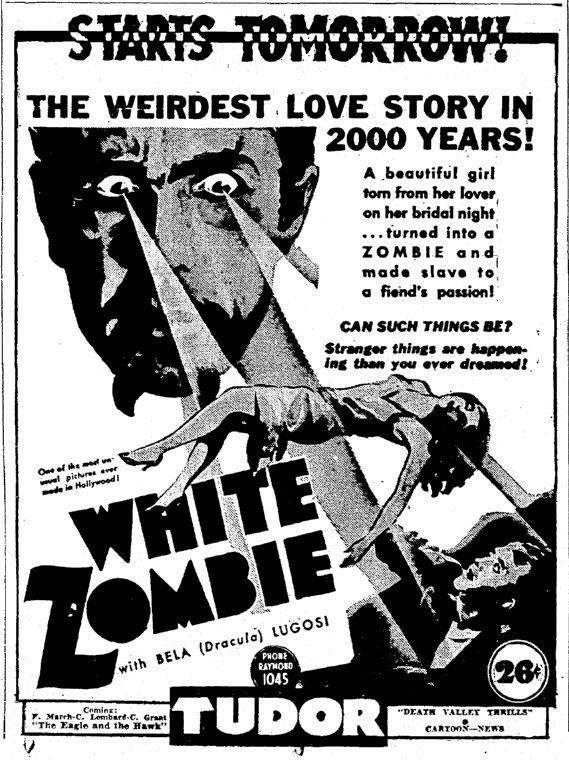 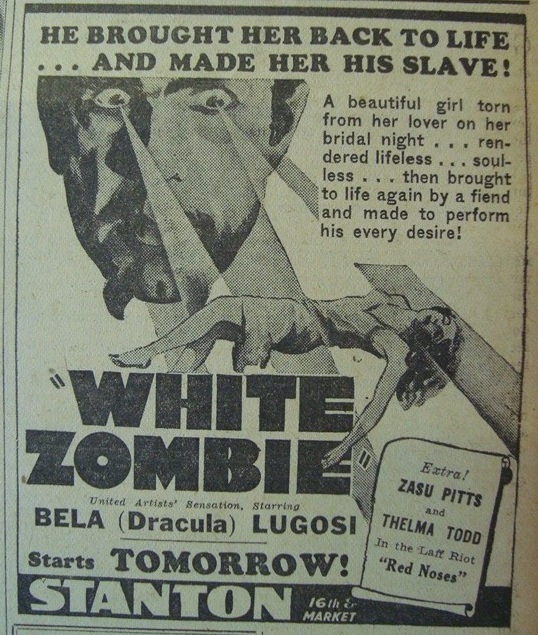 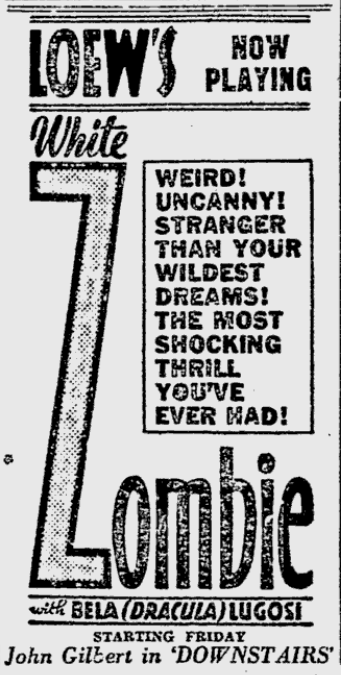 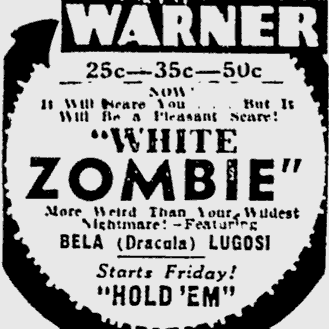 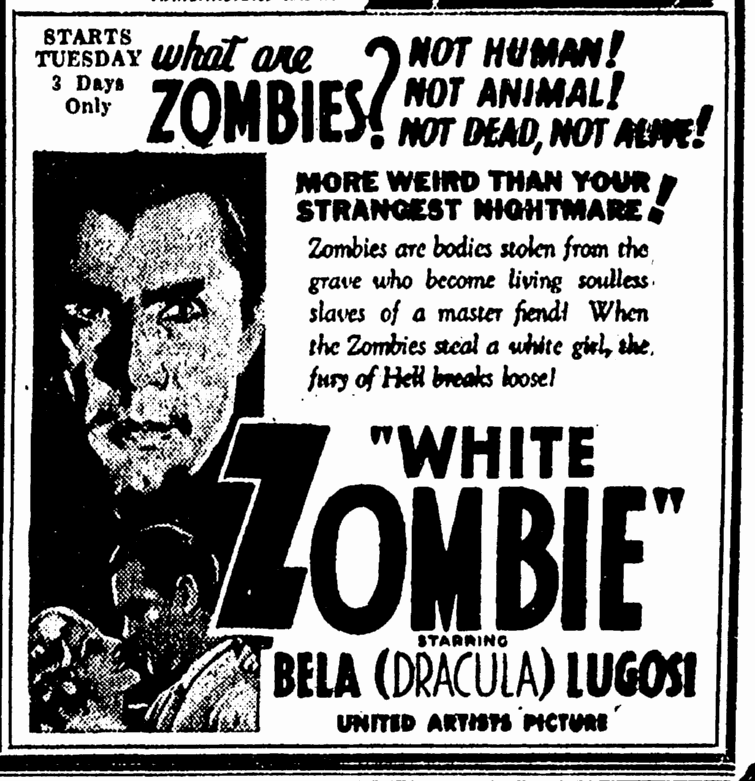 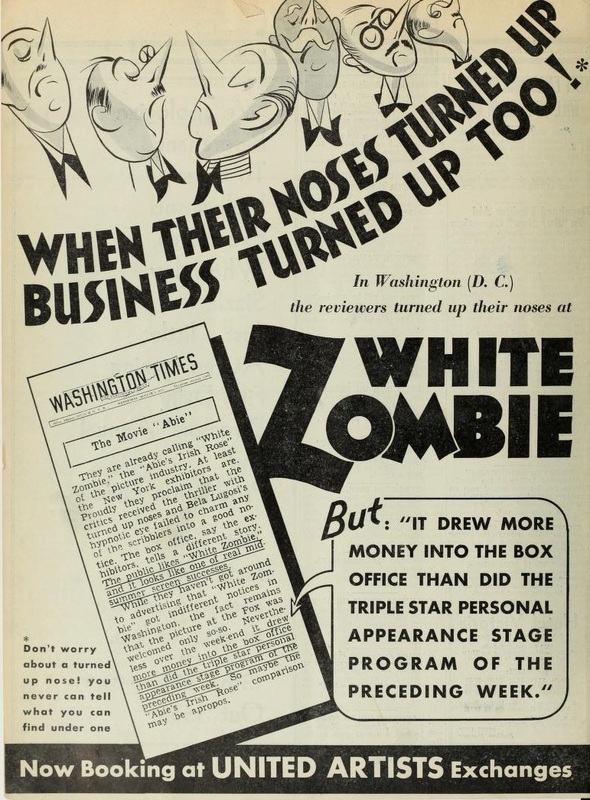 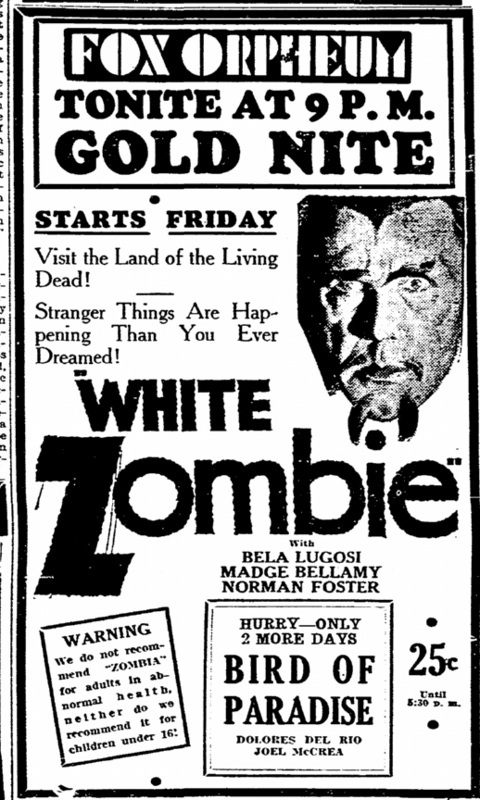 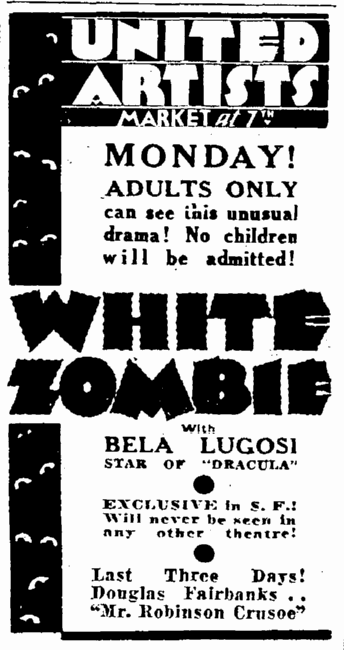 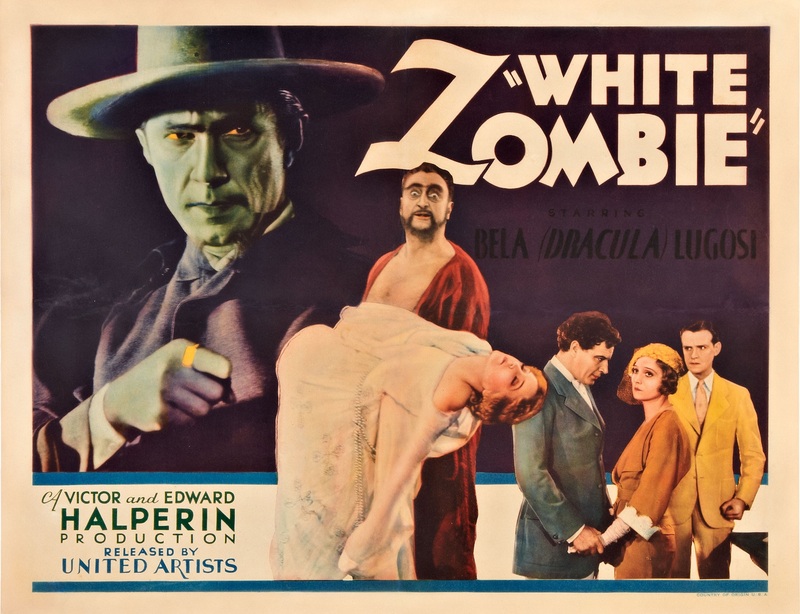 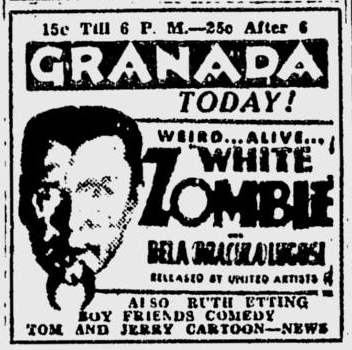 “In order to get the fullest measure of thrills in ‘White Zombie,'” says Manager J. Y. Robb, “one should attend a midnight performance of the picture; and in order to accommodate those who want their thrills at their thrillingest, we will hold a midnight show Saturday, starting at 11:30 o’clock. 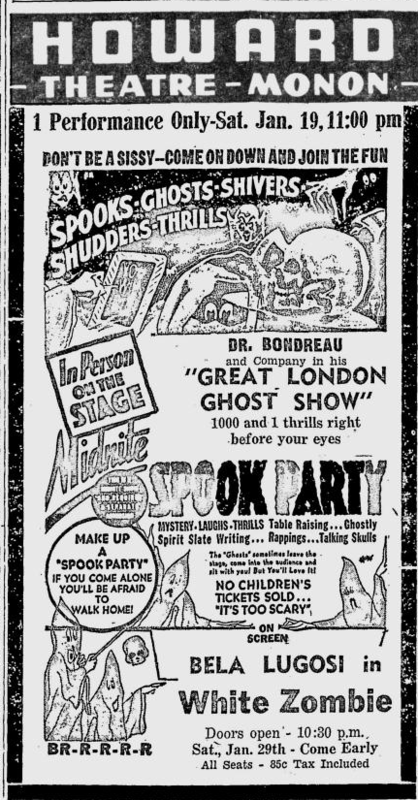 Regular performances will be held Sunday and Monday.” Mr. Robb states further that persons not in tip-top physical condition should refrain from attending exhibitions of this weird picture. 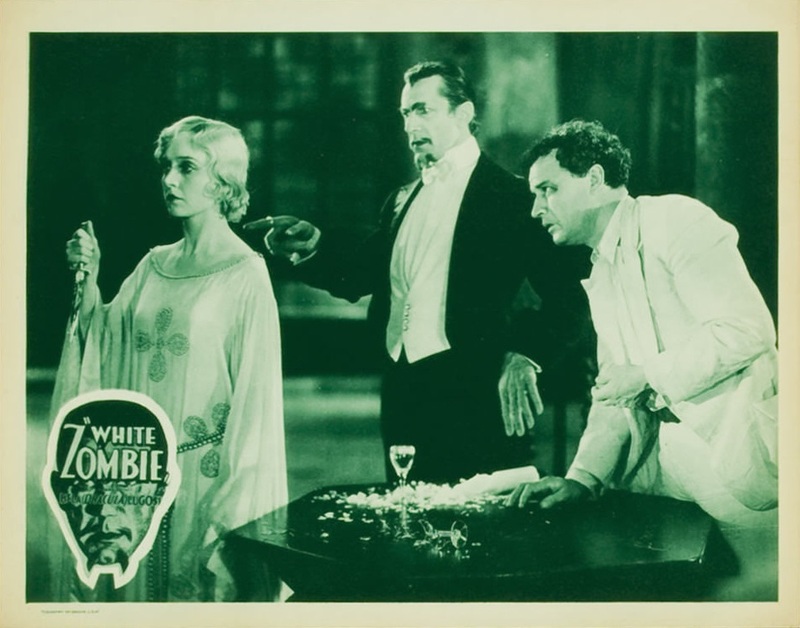 WHITE ZOMBIE – United Artists. 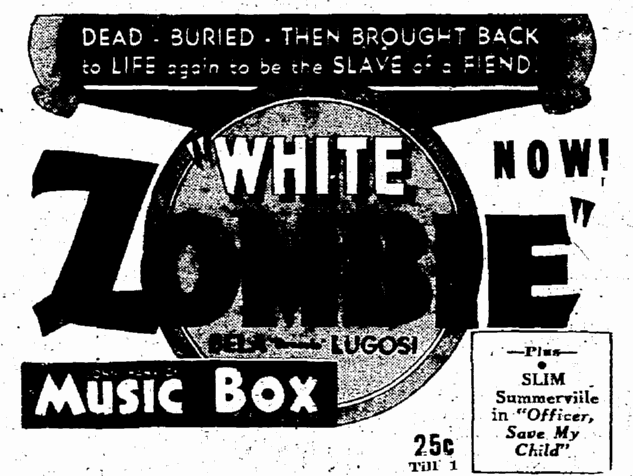 – An utterly fantastic tale about the half dead, known as zombies, who rise from their graves. 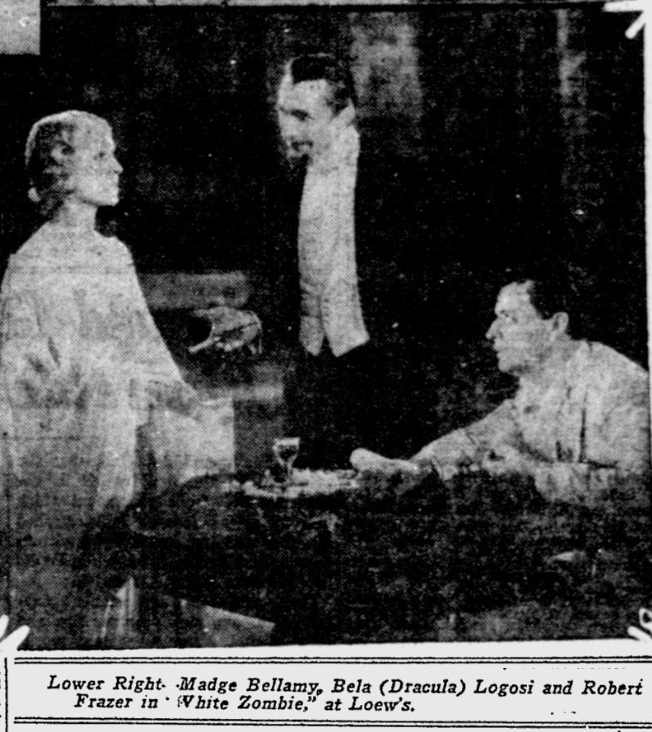 Madge Bellamy and Bela Lugosi. 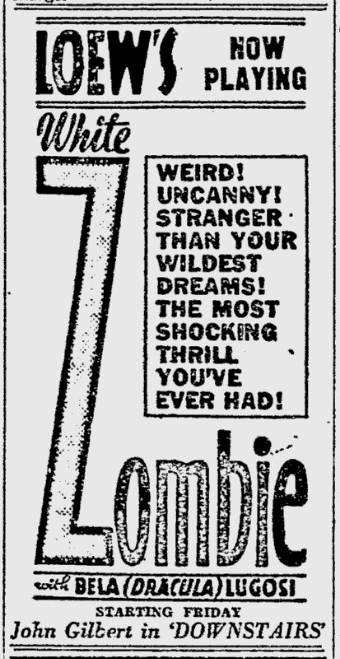 And you don’t need to bother seeing it.